On this page ... Potts or Potts Brothers, Priestman, Robinson, Shipbuilding Corporation Limited. And page bottom (Apple advertising label). Copyright? (1 + 42 + 4 + 8 = 55) Test. A few words about 'Potts', hopefully with more definitive data in the near future. Written initially as a place to contain the existing listing re Cornelius, built in 1837, now the builder is known. I read, in a guestbook message by Joanna Hammond, that the first William Potts (#1) had a shipyard possibly located at Hylton Ferry. That shipyard was taken over by his son, also William Potts (#2) (?/1850) & later by 'R. H. Potts and Brothers' or 'Potts Brothers' i.e. Robert Hutton Potts, Lipton Hutton Potts and Charles Hutton Potts., all children of William Potts #2. Somewhere along the line, there was a 'Potts' yard at Low Street in Sunderland. Need help! Now there were many Sunderland area shipbuilders with the name of Potts. And an extensive study of them has been long since prepared by Bill Swift. I was intending to 'set the stage' if you will, in this spot, for Bill's research study but after many months I have not got that accomplished. So I now make available Bill Swift's extensive research study with its introduction & 8 chapters no less, in a large 'pdf' document of over 35 pages. Enjoy. I will be happy to forward to Bill Swift, any questions or comments you may have re his 'Potts' study. You might send your request to me here. SIR JOHN PRIESTMAN & CO. (or COMPANY), from 1921 or 1923? SIR J. PRIESTMAN & CO. LTD., from 1921 or 1923? I have read that John Priestman (1855-1941), later Sir John Priestman, was born in Bishop Auckland, the son of a baker. Now the webmaster thought that he remembered that Bishop Auckland was in far away Scotland. But that is not so. It is located on the River Wear above the cathedral city of Durham, so was relatively close by. Anyway, he came at a very young age to Sunderland & was, at the age of 14, apprenticed at the Blumer shipbuilding yard. He later became Chief Draughtsman for Pickersgill, after having served in the Blumer drawing office. At Pickersgill, he in 1880 designed Camargo, their first iron steamer, but in 1882 left them to establish his own shipbuilding yard, known as Castletown, in Southwick, to the west of the Pickersgill shipyard. It looks as though he took over a yard there previously owned by G. S. Gulston. A site that had been vacant for a few years - from 1876 to 1882 perhaps. Troutbeck, of 817 tons, was the first ship that Priestman launched - on Aug. 1, 1882. 'Where Ships Are Born' states Isle of Cyprus was the first, in 1883. Now Isle of Cyprus was the first 'Priestman' hull number indeed (#1) but it was not the first launch - being launched rather later, on Feb. 22, 1883. Where Ships Are Born refers to John Priestman playing tennis in the shipyard with his manager, to the amusement of viewers on the south bank of the river - when the yard was idle during recurring depressions. There were many many vessels to come including ships most similar to the 'turret' ships built by Doxford. The Priestman equivalents were termed 'tower-deck' (or maybe 'trunk-deck') vessels. They looked somewhat like turret ships but had a different arrangement of vessel plating. The yard was in operation for 51 years, but in 1933 it closed for good. The yard itself was physically still there, however, & was resurrected in 1944 by William Pickersgill & Sons Ltd., with assistance from the Admiralty, for use in building needed new tonnage during WW2. A puzzle to the webmaster is a 1937 reference in a Sunderland Industrial Handbook to the yard having grown from 4 acres in 1882 to over 12 acres in 1937. With, in 1937, four berths capable of building ships of all types of up to 600 feet in length. If the yard was indeed out of business in 1933, why such a 1937 listing? I suspect that it may be that the business did not technically close in 1933, rather that the last Priestman built vessel was sold in that year. And that there was no subsequent Priestman shipbuilding activity. Can anyone clarify? John Priestman (image at left ex 'Where Ships Are Born') was knighted in 1921 (or maybe 1923) & awarded a Baronetcy in 1934. Re both titles you are addressed as 'Sir', I understand. He died in 1941. Sunderland's greatest philanthropist, it would seem. He supported a great many charitable causes in his lifetime & in 1931 endowed a charitable trust (1), bearing his name that still serves the areas of the former counties of Durham and Yorkshire to this very day. Its purposes include the 'feeding of poor... in times of distress', the 'employment and payment of nurses for the sick and infirm' & the building, 'maintaining and furnishing (including provision of organs)' of 'churches and mission halls and schools'. Most recent (2003 & 2004) trust donations were however to the churches & to the more general category of 'any charitable institution for the benefit of .. inhabitants of the County of Durham and in particular of ... Sunderland'. In his will he gave over �1.5 million, an amazing sum for those times, to many more charitable causes. The list is long & includes the donation of organs to local churches (he was a keen organist) & funds to rebuild St. Michael's Church in Bishopwearmouth. A fine image of Sir John Priestman is here. He (& his sister) earlier had built St. Andrew's Church in Roker, in memory of Jane Priestman, their mother. Funds were provided with a condition - that the church have a tower visible from the sea - & accordingly the church tower is on the east end of the church where normally it would be at the west end. It is interesting to read (1 & 2) that Priestman made his fortune not perhaps from the shipyard per se, or as a colliery owner though he was that also, as you might expect, but rather from investing the yard's profits to great advantage in South African goldmines & diamonds! I had hoped to find an obituary on the WWW that might expand upon the above. And now, thanks to a kind site visitor, I am able to provide the Sir John Priestman obituary which was published in the London Times, of Aug. 7, 1941. You can read it here. lf you can provide additional data about Sir John, your contribution would be most welcome. Author Jean Wood has been in touch (thank you Jean!) to advise that Sir John Priestman married twice. In 1880, he married Naomi, daughter of D. P. Huntly, of Sunderland. They had no children & Naomi passed on in 1908. In Jul. 1915, he married his second wife, a distant relative of Jean Wood (2nd cousin twice removed). She was Sarah Marie Pownall (1880/1971), the elder daughter of A. E. Pownall, a Chorlton (Manchester) doctor & his wife Marianne (n�e Duterrau). Marie (she would appear to have been known as Marie rather than as Sarah), was rather younger than Sir John - by 25 years - and lived to age 90. She died only in 1971, 40 years after Sir John had passed away. There was one daughter, born in 1921, by the second marriage - Barbara M. Du T. Priestman ('Du. T.' likely means 'Du Terreaux'). Pauline Priano adds to the family history (thanks!) - Sir John Priestman was my great grandfather�s 1st cousin. His father, Robert Priestman, was indeed a baker with premises at Bondgate Street in Bishop Auckland. His father was born in Newcastle-upon-Tyne in 1824 & died there in 1867. Robert married Jane Smith (1830-1903) on Nov. 11, 1849 at St. Andrews, Bishop Auckland. Barbara Marie D. T. Priestman (1921/Mar251963), Sir John's daughter & Robert's grand-daughter, married Christopher John Leslie in 1954 in Westmorland. They had two children Angela Marie Leslie born in 1955 & Christopher B. Leslie born in 1959. One of Sir John�s sisters, Polly, was born in 1853 at Bishop Auckland (died Mar. 25, 1940 at Poole, Dorset). She married Walter De Lancey Wilson, later knighted, twice Mayor of Gateshead, & founder of the Walter Wilson supermarket chain. Polly was his second wife & the couple had a further two children. We end this section on a sad note! Susan Singleton has been in touch to advise that William W. (Weston) Robinson, Susan's grandfather, maybe employed as a concrete band fixer, lost his life at the Priestman shipyard on Apl. 2, 1930. He was in his prime of life, just 30 years of age, when he died as a result of a fall from a great height. His wife, Ellen Robinson, was left with little money and a 4-month old baby girl (Susan's mother Anne Robinson) to bring up. William's memorial card is here. Can anybody tell us what a 'concrete band fixer' would have done in a 1930s shipyard! Miramar lists? (highest hull number on page). It used to be that you could click on the links that follow & get to the relevant Miramar page. But no longer! The new procedure must be to go to Miramar (here) & log in (you must be registered to view any page). And once you are logged in, return to this page & all the following links should work for you:- 32, 68, 106, 240, 284, 299. (199) A 'build list' of 'Priestman' vessels can now be found, on site, here. Names of vessels constructed by 'Priestman'. As I find them. In a table in build date sequence. Not very many so far, however. An iron cargo ship, schooner rigged, that had a great many owners. Per 1 (1882 ref. to launching, true p.293. Hard to find so text is available at left via thumbnail), 2 (page in Norwegian, extensive history in English & image as Jeanne d'Arc), 3 (Norwegian 'pdf' page, #16, data), 4 (Newbiggin, p.12, 1886), 5 (Miramar, link, you now must be registered to access). 250.5 ft. long perpendicular to perpendicular, speed of ? knots. Built for Perry, Raimes & Co., (Miramar states 'Raines') of West Hartlepool, U.K., & named Acaster, by Mrs. Cundall, at the launch. A series of West Hartlepool owners but with no change of name. W. E. Bagshaw became the owner in 1883. That name may correctly be 'Bagshawe and others', the name referenced in 'The Nautical Magazine' of 1884 respecting an Inquiry into the loss of a seaman, swept overboard on Jan. 23, 1884, in very heavy seas, with another severely injured (see left). Carrying iron ore. J. Wood & Co. became the owner in 1884, & R. Livingstone & Co. in 1889. It would seem that the vessel needed the assistance of the Newbiggin Lifeboat Station on Dec. 22, 1886, but no detail as to circumstances. In 1891 the vessel was 'taken over' by Livingstone, Conner & Co., also of West Hartlepool. In 1896, vessel was sold to 'A/S Ganger Rolf' (Bertrand Heyerdahl, the manager), of Kristiania (Oslo), Norway, & renamed Jeanne d'Arc. (Miramar refer to J. Meinich & Co. in 1895). In 1900, sold to 'A/S Ganger Rolf', Ganger Rolf Shipping Line, (Fred. Olsen, the manager), of Kristiania, with no change of name. In 1908, vessel was sold to 'A/S Kerguelen', (Storm, Bull & Co., the managers), of Kristiania. 'A/S Kerguelen' was, I read, a sealing & whaling company & the vessel was used as a supply ship for Jeanne d�Arc, (now Port-Jeanne d'Arc) a newly established shore-station at the French Kerguelen Islands, in the southern Indian Ocean. In 1912, the vessel was sold to 'D/S A/S Granli' (Thygo S�rensen & Birger Lie, the managers), of Kristiania, & renamed Granli. And in 1913, was sold to 'A/S P. O. Haavik' (Andreas Simonsen, the manager), of Haugesund, Norway, & renamed P. O. Haavik. On Feb. 22, 1914, the vessel grounded at La Canal de Ibiza, Balearic Islands, Spain, while loading salt. It must have been quite a grounding because the vessel would seem to have been wrecked there. Can you correct or add to the above? A cargo ship, schooner rigged. Per 1 (data, Isle of Cyprus), 2 ('pdf', 1883 grounding inquiry report), 3 (Miramar, link, you now must be registered to access). 225.2 ft. long, speed of 8 1/4 knots. Built for 'Dixon, Robson & Co' which entity changed its name to 'Isles Shipping Co.', in 1908. On Apl. 17, 1883, however, the owner became Thomas Dixon, Jun.' & others, of Newcastle, Thomas Dixon having been on that date appointed the managing owner. On May 1, 1888, the vessel left St. Vincent, Cape Verde Islands, in ballast, bound for Pomeron, Portugal, (NW of Gibraltar), with a crew of 17 all-told & with James J. (Joseph) Hebron, in command. On May 6, 1888, the vessel ran aground, in hazy conditions, near St. Ann's Bay, N. of Cape Corveiro, Western Sahara, W. coast of Africa. The vessel freed itself, unassisted, & was temporarily repaired at Las Palmas, Canary Islands. The hull was however badly damaged & the vessel proceeded to the Tyne for repairs at Messrs Smith's dock. An inquiry into the grounding was held in Jun. 1888, & the Master was found (alone) to be in default due to negligent navigation & was reprimanded. In 1897, the vessel was sold to C. W. Akerson (who may well be the agent rather than the owner), of Gefle, Sweden, & renamed Britannia. The vessel was again sold, in 1916, to K. Henningsen, (same comment), of Norrk�ping, Sweden, & renamed Bj�rnvik. Bj�rnvik seems to be a place name in Finland, though that may be irrelevant. Was broken up at Copenhagen, Denmark, in Q4 of 1936. Anything you can add? A cargo ship, 3 masts, clipper stem, intended to be schooner rigged, but maybe square rigged? Per 1 (1885 ref. to Jun. 13, 1885 launching, p.105 Walter de Lancy & ref. on p.257), 2 [Elder Dempster, Biafra (2)], 3 (Biafra data), 4 (same data, 3rd item), 5 (Miramar, link, you now must be registered to access). 200.8 ft. long, speed of 9 knots. A mystery re this vessel or so it would seem. While it would appear to have been named (by Miss Lillie Priestman) Walter de Lancey (or Lancy) at its Jun. 13, 1885 launch, it would seem to have become registered as Algarve (must be the same vessel - so much of the data matches). Delivered in Jun. 1885 to A. Centeno, of Lisbon, Portugal. In 1899, sold to Alfred Booth of Liverpool, but not a Booth Steamship Company vessel. Sold in 1890 to African Steam Ship Company, Limited (Elder Dempster Lines) & renamed Biafra. The vessel was likely hit by a storm when on Nov. 30, 1892 one crew member was lost. While en route from Lagos, Nigeria, to Hamburg, Germany, under the command of D. P. Dupeo, with a cargo of palm kernels. The incident, whatever it was, took place at New Calabar on the W. coast of Africa. The driving wheel of the vessel's capstan was broken but the listing does not state what exactly occurred. Biafra was used for feeder services along the W. African coast. In 1896, was sold to Rasmus F. Olsen of Bergen, Norway, & renamed Tryg. Square rig was removed. On Feb. 13, 1913, while en route from Bergen to Halifax, Canada, she foundered 70 miles off Portland (yes), Iceland. Can you correct or add to the above? A cargo ship, a collier. Per 1 & 2 (Sir Henry Samman, 1849/1928, ['Samman'] & Deddington Steamship Co.), 3 [the Samman fleet, Deddington (1)], 4 (Sirius, Finnish page), 5 (link4 translated), 6 ('convoyweb.org', WW2 convoy duty, insert Sirius), 7 ('plimsollshipdata.org', Lloyd's Register data 1930/31 thru 1944/45, Sirius), 8 (Miramar, link, you now must be registered to access). 280.5 ft. long (85.50 metres), speed of 9 knots, signal letters LGHW later KFNB & SGTN. Built for Deddington Steamship Co. Ltd., of Hull, owned & managed by 'Henry Samman & Co.'. Samman served as Deddington's managing director. The company was presumably named after the village in which Samman was born i.e. Deddington, Oxfordshire. I read that Deddington spent much of her time in the far east transporting coal from Australia to Batavia, as well as carrying wool back to England. In 1899, the vessel was sold to Danneborg Shipping Co., of Denmark, (C. K. Hansen, the manager), & renamed Frederiksborg. And in 1914, she was sold again, to Orion Shipping Company, (C. P. Jensen, the manager), also of Denmark, & renamed Sirius. In 1924, the vessel was sold for the last time, to 'Rederi - A/B Iris' (Iris Shipping Company) of Stockholm, Sweden. C. Abrahamsen certainly were the managers from 1930/31. 12 convoy references during WW2, mainly from U.K. to Norwegian waters, but some coastal U.K. voyages also (carrying coal where cargo is indicated). On Dec. 12, 1944, while en route from Sundsvall, Sweden, to Mantyluoto, Finland, with a cargo of coal, the vessel was wrecked near Bjorneborg, Finland. Miramar states it was wrecked 2 miles SE of the S�bbsk�r Lighthouse, which would seem to be near Pori, Gulf of Bothnia, W. coast of Finland. I cannot track the exact location of such lighthouse. 4 explains, I believe, the circumstances in Finnish, but translation is difficult. I can only say that it would seem that the weather was bad & the disaster was due to navigational error. No lives would seem to have been lost. Salvage tugboat Poseidon was involved, & the wreck was located in 1992. Can anybody advise the essence of what link 2 says, in English. Can you correct or add to the above? Another image? A cargo ship. Per 1 (grounding report, Aug. 28, 1892, 'pdf' available), 2 (Lennok, 1915 sinking data), 3 ('uboat.net', sinking Lennok), 4 ('wrecksite.eu', Lennok sinking data), 5 & 6 (U-20), 7 (Miramar, link, you now must be registered to access). 70.6 (or 70.53) metres long, perpendicular to perpendicular, 231.5 ft. long, schooner rigged. Miramar indicate that the vessel was built for 'T. P. Richards & Co.' ('Richards'), of Swansea, Wales. But ... 4 refers to the owner having been Richards, Turpin & Co. Ltd., of London, I believe. Now the webmaster has a couple of editions of Lloyd's Register available to him from 'Google' books, thru 1890/91 - see left. It would seem that registration was intended to be in the name of Richards but the vessel was rather registered in the name of 'Steamship Cheriton Co. Ltd.', with Richards the managers. As is confirmed in the 'Priestman' build list available here. Later editions of Lloyd's Register would be helpful in regard to later ownership but are not available to the webmaster. On or about Aug. 25, 1892, the vessel left Cronstadt for Amsterdam with a cargo, including deck cargo, loaded at Saint Petersburg & Cronstadt (also known as Kronstadt, the port for Saint Petersburg, northern Russia, on the Gulf of Finland). James Luty was in command, with a crew of 17 all told. On the morning of Aug. 28, 1892, the vessel ran aground on the S�berbriton Shoal, Gotland. I cannot spot exactly where on the Island of Gotland that was. A part of the cargo was jettisoned & water ballast was pumped out of the ship's tanks, all in an attempt to lighten the vessel. At about 3:00 p.m. the vessel was successfully floated off. It was taking water & with all pumps working, it proceeded to Carlscrona, Sweden (on the Baltic), where it arrived at 8:00 a.m. on Aug. 30, 1892. The vessel's plates were damaged & 3 of the propeller blades had been broken. Temporary repairs including a new propeller were effected, a part of the cargo was discharged & the vessel proceeded to Amsterdam, its original destination. The vessel returned to Monmouth, Wales, for permanent repairs that cost �3,000. The Court attributed the grounding to careless navigation. The captain's certificate was suspended for a 3 month period while the 2nd officer was found to have kept his look-out in an unseamanlike manner. No lives were lost. In 1910, the vessel was sold to Joh. Linde, of Pernau, Russia (now P�rnu, Estonia), & renamed Lennok. On Jul. 13, 1915, Captain Raak in command, while en route from Archangel to London, the vessel was stopped by U-20, Kapit�nleutnant Walther Schwieger ('Schweiger') in command, when NE of the Shetland Isles. The crew was ordered to abandon ship & Lennok was then sunk by gunfire. About 35 miles NNE of Muckle Flugga, the northern tip of Shetland Isles, said to be at 61.05N/2.25W, which reference seems to be a little in error. I read that there were no casualties - I presume that the crew made it safely to land. You may be interested to know that Schwieger is noted for having sunk the Lusitania on May 7, 1915, off the Old Head of Kinsale, with approx. 1,200 lives lost. Can you correct the above as required, and/or provide additional data? An image perhaps? A cargo ship. Per 1 (data in Norwegian, ex here, a Word document, #56), 2 (13/3 1918, ref. to sinking), 3 (UB-34), 4 (Adine not included in WW1 loss list), 5 (Miramar, link, you now must be registered to access). 290.4 or 290.5 ft. long. Built for 'Harloff & B�e', of Bergen, Norway. In Jul. 1893 sold to 'Andr. Olsen', also of Bergen. In 1911, sold to 'Otto Banck', of Helsingborg, Sweden & renamed Fama. On Dec. 8, 1915 sold to 'D/S A/S Blus' (Harald Hansen (or maybe Hanssen?) the manager? ), of Skien, Norway, & renamed Blus. In Feb. 1916, sold to 'D/S A/S Adine', of Kristiania i.e. Oslo, Norway, (C. H. Engelhart & E. I. Hansen, managers) & renamed Adine. Later that year, in Dec. 1916, sold to 'D/S A/S Lloyd I' (Louis Poulsen & Co. manager), also of Kristiania. On Mar. 13, 1918, while en route from Rouen, France to the Tyne in ballast, was attacked & sunk by UB-34, at 54.42N/00.58E in the North Sea. The few references to the sinking are a small puzzle. Can you correct the above as required, or provide additional data? An image perhaps? A cargo ship. Per 1 (Wilson Line, Murillo), 2 (French data & image, Guipuzcoa), 3 (extensive Spanish data, Ger�nimo & Guipuzcoa, image), 4 (Guipuzcoa abandoned, ex the Mar. 25, 1925 edition of 'La Vanguardia, l'Ouest-Eclair', p#7), 5 ('wrecksite.eu', Guipuzcoa wreck data & image), 6 (Miramar, link, you now must be registered to access). 91.7 metres long perpendicular to perpendicular, speed of 8 1/2 knots, signal letters NGCH. The vessel was launched, as Murillo, on Oct. 25, 1893, by the Mayoress of Gateshead. Built for 'T. Wilson Sons & Co. Limited', i.e. 'Wilson Line', of Hull. In 1914, the vessel was sold to Mrs. Marie J. Mango, or maybe D. A. Mango, of London, registered at Piraeus, Greece, & renamed Eptalofos - 'Mango & Co.', of Piraeus, the managers. In 1916, the vessel was sold to 'Hijos de G. Escudero,' i.e. G. Escudero Sons, of Spain, 'A. de la Sota' the managers, & renamed Ger�nimo. The vessel was sold again, in 1918 - to 'Compa��a Naviera Mundaca', of Bilbao, Spain, & renamed Guipuzcoa. On Mar. 23, 1925, the vessel was en route from Huelva, Spain, to La Pallice, France, with a cargo of pyrites. It would seem that the vessel proceeded after being warned that the conditions were dangerous. It ran aground a mile NW of the La Baleine lighthouse, Pointe des Baleines, Ile de R�, near La Rochelle, France, at approx. 46.14.07N/01.33.07W. Tugs made a number of unsuccessful attempts to free the vessel, which was however abandoned on Mar. 25, 1925. The crew of 26 were taken aboard Atlas (a tug presumably), & landed at nearby La Pallice. We thank Claude Rabault, of 'Epaves du Ponant', for his kind assistance re this listing. Can you correct the above as required, or provide additional data? Another image perhaps? A cargo ship. Per 1 ('uboat.net' sinking, Glenmoor, with an incorrect image, I think), 2 ('wrecksite.eu', sinking, Glenmoor), 3 (data, Glenmoor, image), 4 (U-38), 5 (Miramar, link, you now must be registered to access). 97.9 metres long perpendicular to perpendicular, 324 or 332 ft. The vessel attained 11 knots at her performance trials. Built for 'South Shields Steam Shipping Co. Limited' ('South Shields'), which company was initially of South Shields but moved its head office to Newcastle, Walter Runciman & Co., also of Newcastle, the managing owners. In Apl. 1897, South Shields was renamed Moor Line Ltd. On Nov. 6, 1915, the vessel was in the Mediterranean, en route from Bombay, India, to the Tees with a cargo of manganese ore. The vessel was, I read, captured by U-38, Korvettenkapit�n Max Valentiner in command, & sunk by torpedo, just maybe after the crew had left the ship since there was, apparently, no loss of life. At 37.06N/07.12E, 5 miles NE of the Cape de Fer lighthouse, NE of Philippeville, now Skikda (Sakīkdah), in eastern Algeria. U-38 was a most successful German submarine indeed, sinking 293,124 tons of Allied shipping i.e. 139 ships, including one warship, damaging 7 other vessels & taking 3 more as prizes. Can you correct the above as required, and/or provide additional data? Another image perhaps? A schooner-rigged cargo steamship. Per 1 (data 60% down), 2 (brief wreck ref. ), 3 (wreck data page 149 & modest wreck image), 4 & 5 (wreck listings), 6 (dive images), 7 (site plan & images, page from Czechoslovakia), 8 (Miramar, link, you now must be registered to access). 325 ft. long, speed of 10 knots. Built for 'Glasgow Shipowners Company, Ltd.' (Glen & Co. managers? ), & registered Glasgow. Intended for use on North Atlantic routes. On May 27, 1900, while en route from Philadelphia, Pennsylvania, to Havana, Cuba, in good weather & with a cargo of coal, ran aground 3 miles S of Hillsboro Inlet, Florida. Efforts were made to free the vessel, including unloading the cargo. Efforts continued until Jul. 17, 1900, when vessel was abandoned, a total loss. I read that the vessel & cargo were respectively valued at $250,000 & $12,500. Her most valuable items (engine, boilers, propeller etc.) were salvaged, including vessel's mahogany saloon table, which was used (still is, I wonder?) as a boardroom table by the 'Biscayne Yacht Club'. Crew of 26 stayed with vessel until Jun. 1st. Cause of the accident, per investigation, was the 'improper navigation' of her Captain (William S. Jones). The wreck was used for Navy fighter plane target practice during WW2. Scattered wreck remains today are in 16-31 ft. of water, 3/4 mile off Pompano Beach, Broward County, Florida. A popular dive site. The wreck would seem to be known locally also as the 'Cumberland Barge' (I wonder why). In 1994, the site was dedicated as the 5th Florida Underwater Archeological Preserve. Can you correct the above, or provide additional data? An image perhaps. A cargo ship. Per 1 (Wilhelmsen Line, Trold), 2 (text & image, source of my data), 3 (Miramar, link, you now must be registered to access). 389 ft. (99.1 metres) long, speed of 10 knots. Built for Wilh. Wilhelmsen, of T�nsberg, Norway, or maybe for 'I/S D/S Trold's Rederi', owned by Wilhelmsen. (It would appear there was another Trold in 1914 which is a puzzle, (23/12 1914), also owned by Norwegian owners.) Sold 1915 to 'Axel Robt. Bildt Aktiebolaget', of Sweden & renamed Avanti. Later in 1915 was sold again to Olaf �rvig, of Bergen, Norway, & renamed Thomas Krag. Sold 1917 to 'A/S Thomas Krag' & in 1923 to 'A/S D/S Thomas Krag', both of Bergen. Sold 1927 to George Constantine Lemos, of Greece, & renamed Despina Lemos. Sold 1930 to J. D. Chandris, of Greece, & renamed Dimitrios Chandris. Broken up late 1933 at Venice, Italy, by Ernesto Breda. A cargo ship which became a whale factory ship. Per 1 (de Freitas), 2 (Hamburg-Amerika Linie, Sevilla), 3 (Salvesen), 4 (Polar Whaling), 5 (Lloyd's Register listings, 1930/31 thru 1945/46, ex 'plimsollshipdata.org'), 6 (Miramar, link, you now must be registered to access). 397.0 ft. long, 121.0 metres long perpendicular to perpendicular, speed of 10 knots, signal letters KMLT, later VPNF. Built for 'A. C. de Freitas & Co.', of Hamburg, Germany, but in the same year was part of the 'Freitas' fleet acquired by Hamburg-Amerika Linie. The vessel was interned in Argentina in 1914, was ceded to Britain in 1919 & became owned, in 1922 it would seem, by the Board of Trade. Later in 1922, the vessel became owned by Christian Salvesen & Co. ('Salvesen'), of Leith, Scotland, & involved in whaling operations off the coast of Newfoundland & Labrador & off Antarctica. Registered at Stanley, also known as Port Stanley, Falkland Islands. Became a whale factory ship & carried whale oil in bulk. In 1925, the vessel was owned by South Georgia Co. Ltd., also of Port Stanley, with Salvesen the managers. And in 1931 became owned by Polar Whaling Co. Ltd., of Leith, Scotland, a 'Salvesen' subsidiary. Ray Howgego has advised (thanks Ray!) that Sevilla was first employed as a floating factory ship in Antarctic waters in the 1922/23 austral summer - one of 14 similar factories operating out of six shore stations on South Georgia, South Orkney Islands, etc., supplied by 60 whaleships & auxiliary vessels. She continued in Antarctic service until the summer of 1931/32, & in 1933/34 was replaced on this station by New Sevilla (formerly the White Star Line Runic) which served as a factory ship until torpedoed en route to South Georgia in Sep. 1940. Crewed largely by Norwegians, the Sevilla�s long-term captain was Hans Halvorsen, who in 1928 sighted the Antarctic Vigia �Sevilla Rocks� in 61.28S/23.41W, about 300 km. SW of the South Sandwich Islands. The rocks were shown on the charts for a few years until proved to be non-existent (probably an iceberg). More significantly, during a whaling voyage in Sevilla in Mar. 1931, Halvorsen made the first discovery of Princess Astrid Land, the part of the coast of Queen Maud Land lying between 5� & 20� E. It appears that the Sevilla was used as a transport vessel during WW2. The vessel was broken up, in Jun. 1949, at the Ghent, Belgium, ship breaking facilities of Van Heyghen Freres. I wonder when & where was it rebuilt as a factory ship? Can you add anything? cargo ship. Per 1 & 2 (similar data, Alston, page bottom re 2), 3 (Watts, Watts), 4 (Miramar, link, you now must be registered to access). 105.8 metres long, perpendicular to perpendicular, 347 ft., speed of 12 knots. Built for 'Webster & Barraclough Limited' ('Webster'), of West Hartlepool, a small tramp ship company established in 1879. Angus G. Elliott ('Angus'), of Alberta, Canada, whose father, it is believed, served aboard the ship in the 1919/1920 period, advises that from 1904 to 1913, the vessel travelled extensively, including to Suez, to Rio de Janeiro & Buenos Aires in S. America & to New Orleans & Galveston in the U.S. On Dec. 24, 1915, dynamite was found aboard the vessel, believed to be the result of attempted German sabotage. During WW1 it is known that the vessel travelled to Le Havre & Bordeaux, both in France, & to Genoa, Italy. The vessel was sold three times in quite rapid succession, without any changes of name. In 1917, when Webster went out of business, the vessel was sold to Britain Steamship Co. Ltd., of London, owned & managed by Watts, Watts & Co. Ltd., also of London. It was sold again in 1919, to Sir William Garthwaite (1874/1956. The 'Garthwaite Baronetcy' was created on May 19, 1919, & William became the 1st Garthwaite baronet (addressed as 'Sir'). Sir William Garthwaite was noted for his 1915/1929 fleet of sailing ships, 'Garth Line' perhaps, with ships named with the prefix of 'Garth'.) In 1919, the port of Montreal, Quebec, Canada, referenced its speed in loading ships - in Sep. 1919, Alston was loaded with 7,000 tons of general cargo there in 2 1/2 days. Angus further advises that (per Marj Kohli, of Waterloo, Ontario, Canada, thanks! ), the vessel made at least three Montreal/St. Nazaire, France, trips during the period of Apl. 1919 to Jul. 1920. In 1921, the vessel was sold to Marine Navigation Company of Canada Ltd. ('Marine'), managed by McLean, Kennedy and Co., both of Montreal. Marine, 'practically a subsidiary of a Marine Navigation Co. Ltd. of England, controlled by Sir William Garthwaite, Paris, France', linked Canada & France, it would seem. In 1922, per Angus, the vessel went from North Shields to London, where it was laid up for 19 months. Then had a crew of 42. In 1923, the vessel was sold to 'Hamaguchi Kisen Kaisha', of Amagasaki, Japan, & renamed Kinoene Maru. Note, there are WWW references also to a 'Hamaguchi Kisen Kabushiki Kaisha' of Dairen - the same company? In early 1927, the vessel was en route from Nagoya, Japan, to Dairen, NE China, in ballast. On Mar. 8, 1927, (or maybe on Apl. 7, 1927? ), the vessel was wrecked at Tongochato, off Mokpo (SW tip of South Korea). WWW data re the wreck is fragmentary & have not read the circumstances. Any loss of life? Can you add anything? An image? A cargo ship. Per 1 (Drumgeith, models), 2 (extensive page re Drumgeith model, many images), 3 (Drumgeith model again), 4 (drawings available), 5 [Brocklebank, Matra (1)], 6 (Moller & Co., Therese Moller), 7 ('convoyweb.org' WW2 convoy duty, Therese Moller), 8 (Miramar, link, you now must be registered to access). 108.2 metres long, perpendicular to perpendicular, 355 ft., speed of 9 knots but I have also read 12 1/2 knots. I gather that she could carry a large number of cattle, 'tween decks. Built for 'Village Steamship Co. Ltd.' ('Village'), with 'R. A. & J. H. Mudie', the managers, both of Dundee. In 1912, Village folded, & the vessel was sold to 'Thos. & Jno. Brocklebank Ltd.', i.e. Brocklebank Line, of Liverpool, & renamed Matra. But when was it so sold? In 1915, it would seem, as per Miramar. But who owned the vessel after 1912 when Village folded, thru to 1915? Maybe the sale was rather in 1912? In 1921, the vessel was sold to 'J. Ridley Son & Tully', 'Tyneside Line', of Newcastle, & renamed Newton Hall. The vessel was sold again, in 1927, to Byron Steamship Co. Ltd., of London, M. Embiricos the manager, & renamed Maid of Lemnos. In 1931 or 1932, the vessel became owned by Moller & Co., of Shanghai, China, who renamed the vessel Therese Moller. The vessel was transferred in 1935 to 'Moller Line Limited', of London. Just 5 WW2 convoy references, all in the Indian Ocean it would appear, (Bombay, Madras, Calcutta, Bandar Abbas, Louren�o Marques, Suez). There presumably were independent voyages also, which I am not permitted to access. Carried coal where the cargo is indicated. On Jan. 30, 1947, the vessel was sold to 'Mak Man Sang', of Hong Kong, & renamed Chi Hing. And in 1954, the vessel was sold again, to 'China Overseas Lines Ltd.', but have also read 'Chinese Maritime Trust', of Shanghai, the managers maybe?, & renamed Tien Ping. Miramar advise that the vessel was broken up, in the Far East, in 1954. WWW data is not particularly extensive, except for models of her! Can you add anything? A cargo ship. Per 1 [Howard Smith, Burwah (2)], 2 ('convoyweb.org' WW2 convoy duty, Burwah), 3 (3 images Burwah), 4 [data, 40% down, BURWAH (11)], 5 & 6 (Cooma, aground), 7 (Burwah aground 1937), 8 (Miramar, link, you now must be registered to access). 84.0 metres long, perpendicular to perpendicular, 275.5 ft., speed of 12 knots. At her trials she recorded 13 1/2 knots fully loaded. Built for 'Australian Steamships Limited', owned & managed by 'Howard Smith Co. Limited', of Melbourne, Australia (collectively 'Howard'), the 2nd of 3 fleet ships of the name. Howard provided coastal shipping services throughout Australia. Her maiden voyage was from Sunderland to Sydney, New South Wales, via Fremantle, Western Australia. Burwah serviced the E. coast from Melbourne to Cairns; later on serviced the Adelaide/Rockhampton route; & later on still the Sydney/Melbourne route. On May 7, 1913, William Malcolm, 2nd mate, fell overboard & was drowned. On Jul. 7, 1926, Cooma, left Brisbane for northern Queensland ports with about 200 passengers aboard. At 7 p.m. that day, she ran aground in heavy seas on the southernmost section of North Reef, about 80 miles from Rockhampton, near Heron Island, Queensland. Burwah responded to the SOS, Captain R. Haswell in command, & arrived at the scene at 10 or 10:30 p.m that same day. Next morning she took Cooma's passengers aboard via 2 lifeboats from each of Cooma, Burwah & Ulooloo, the lifeboats towed to Burmah by 3 launches of HMS Moresby. No loss of life. Cooma's officers & crew were taken aboard HMS Moresby. Burwah landed the passengers at Port Alma, 60 miles distant. Cooma never moved from the spot, was later gutted by fire on Jan. 26, 1927 & ended up a total loss, sold for just �150. Burwah was laid up for a while from May 1932, maybe until early Jun. 1934. On Aug. 16, 1937, the vessel ran aground on a mud bar at the harbour at Newcastle, New South Wales. In late 1937, Burwah rescued the 39 person crew of Saros, which went aground in heavy fog at Point Hicks (Cape Everard), on the Gippsland coast on Dec. 25, 1937. And landed them at Sydney. 29 WW2 convoy references, all Australian coastal. In 1947, the vessel was sold to Tsu-Yau Lin, of China, & renamed Chi Hwa. In 1948, the vessel was sold again, to Tai Ho Steamship Co., of China also?, & renamed Dah Tung. On Feb. 16, 1951, the vessel arrived at Hong Kong, to be broken up. Can you add anything? A cargo ship. Per 1 (Billmeir & Stanhope, Stancroft), 2 (data & image Valira, 45% down), 3 ('overboard' ref. 90% down), 4 (Lloyd's Register data, 1931/32 thru 1945/46, ex 'plimsollshipdata.org'), 5 (Miramar, link, you now must be registered to access). 73.1 metres long perpendicular to perpendicular, speed of 9 knots, signal letters HNJW, MCWS, GJGG & EHTY. Built for 'Newbiggin Steam Shipping Co. Ltd.', of Newcastle. Interestingly, in 1937 it would seem that 2 seamen were swept off the ship during a storm & then swept back aboard by the very same wave. In 1937, the vessel was sold to Stanhope Shipping Co. Ltd. or maybe Stanhope Steamship Co. Ltd. (collectively 'Stanhope'), of London, Jack Billmeir or J. A. Billmeir & Co. the principal and/or manager, & renamed Stancroft. Stanhope, had, in 1936, become heavily involved in carrying cargo to Republican ports during the Spanish Civil War. Later in 1937, the vessel was sold to G. M. Mavroleon, of Greece, & renamed Neoptolemos. In 1938, the vessel was repurchased by Stanhope & re-named Stancroft. The vessel was arrested in 1938 by British Navy vessels & charged with transporting weaponry to Spain contrary to law. I have read snippets but not enough to summarise the resulting lawsuits. On Dec. 27, 1938, the vessel was attacked by Spanish rebel aircraft during an air raid on Barcelona harbour & sunk. Direct hits. No loss of life. It was raised in 1939 by the Spanish Government &, owned by 'Empresa Nacional Elcano', was renamed Castillo Almansa. In 1959 the vessel was sold to 'Marcosa' (Maritima Colonial? ), & renamed Valira. On Mar. 29, 1967, the vessel arrived at the 'Desguaces y Salvamentos' ship breaking facilities, at Avil�s, Spain, to be broken up. Can you add anything? A cargo ship. Per 1 (wreck data & location), 2 (wreck data), 3 (uboat.net), 4 (Gibraltar), 5 (20 July 1917), 6 (sinking), 7 (words re UC class submarines & UC65 & C15) 8 (Miramar, link, you now must be registered to access). About 125 metres long, speed of 10 knots. Built for James Westoll, or maybe James Westoll, Ltd., of Sunderland. Vessel was apparently detained at Gibraltar in Mar. 1916. On Jul. 20, 1917, defensibly armed, while en route from New York to London via Plymouth with a cargo of oats & steel (billets & forgings for the Ministry of Munitions), vessel was either (data conflicts) i) torpedoed by UC-65 or ii) hit a mine, & sank. At 50.28.8N/01.51.4W, 16 miles SE of Anvil Point, Swanage, Dorset. All 29 crew were saved. The wreck, identified by recovered pottery, lies in 40 metres of water. I read that UC-class boats were mine-layers, with distinctive vertical mine-laying tubes along the centreline of the forward part of the hull. After laying their 18 anti-ship mines they would stalk ships with their torpedo and gun armament. UC-65 itself lies in 2 pieces off the S coast of England, off Eastbourne, having been torpedoed by HM Submarine C15 on Nov. 3, 1917. Only 5 of the crew survived. Can you add anything? An image? A cargo ship. Per 1 (Siljan), 2 (an informative uboat.net page), 3 (U-53), 4 (U-53, in German), 5 (Miramar, link, you now must be registered to access). 105.9 metres (surely not 305.6) long perpendicular to perpendicular, speed of 11 knots. Built for 'D/S A/S Vard', or 'D/S Vards Akrierederi', of Kristiania (Oslo), Norway, A. Jacobsen, the manager. In 1915, the vessel was sold (D) to 'Rederi-A/B Transatlantic', of Sweden, G. Carlsson the manager, & renamed Siljan. 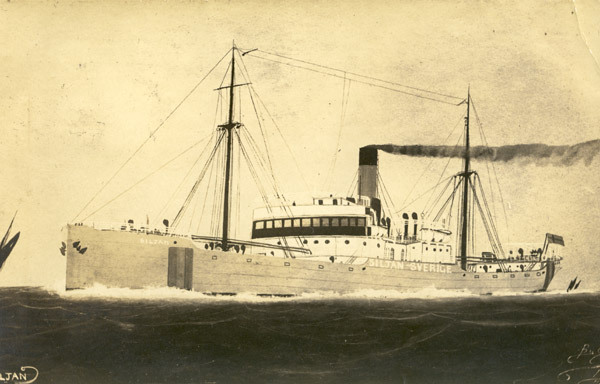 In 1916-1919, the vessel was on a Calcutta, India (via Gothenburg/G�teborg) service to New York. In 1930, the vessel was sold again, (or maybe transferred? ), to 'Rederi-A/B Rex', of Stockholm, Sweden, K. M. Kallstrom, the manager & renamed Dalar�. At 9:35 a.m. on Feb. 12, 1940, while en route from Rosario, Argentina, to Malm�, Sweden, (via Buenos Aires & Gothenburg), with a cargo of 5400 tons of linseed in bags, the vessel, a neutral vessel, was sunk by a torpedo fired by U-53. The vessel may have been stopped by U-53 to permit the crew to take to the boats? Yes/No? At 56.44N/11.44W, 94 miles SE of Rockall, west of Scotland. The Captain (his name?) lost his life. All of the other crew members (29) were picked up, after 17 hours, by Jan de Waele (324 tons), a Belgian trawler, & landed at Buncrana, Lough Swilly (County Donegal in NW Ireland). Can you add anything? A cargo ship. Per 1 (extensive data in Hungarian), 2 (English equivalent of link 1), 3 (Argentine Government 1941 take over, 70% down, a table), 4 (data in Spanish, Rio Primero), 5 (Miramar, link, you now must be registered to access). 114.3 metres long, perpendicular to perpendicular, speed of 10 knots. Built for 'Hungarian Levant Steamship Co. Ltd.', of Fiume, now Rijeka, Croatia, then part of the Austro-Hungarian Empire. The vessel was 'intercepted' at Port Said, Egypt, in Aug. 1914, allowed to sail to Beirut, Lebanon, subsequently attempted to return to the Adriatic, but was forced to shelter in Italian controlled waters. Can anybody clarify the WW1 experience of the vessel? On May 23, 1915, the vessel would seem to have been seized by the Italian Government, & later that same year, sold to 'Olasz Korm�ny', of Genoa, Italy. Renamed Cervino in 1916. In 1923, 'E. Cesano', also of Genoa, would seem to have become the owner. In 1924, the vessel was acquired by 'Andrea Zanchi & Co.', of Genoa, with 'Marini & Brichetto', the managers. On Aug. 25, 1941, the owners became 'Flota Mercante del Estado', of Buenos Aires, Argentina, i.e. the Government of the Republic of Argentina, who took control of Italian steamers then in Argentine ports. May have been earlier interned. The vessel was renamed Rio Primero. In 1946, the vessel was returned to its earlier owners, i.e. Andrea Zanchi, & became Cervino again. On Jan. 26, 1959, the vessel arrived at the Savona, Italy, facilities of 'Ardem Co.' to be broken up. What was the vessel's WW2 involvement? I am sure that the above contains errors. Can you correct them or otherwise add anything? An image? A cargo ship. Per 1 [Howard Smith, Time (2)], 2 (wreck, 90% down), 3 (image, aground, 1949), 4 (data), 5 (Queenscliff museum, 70% down), 6 ('pdf' map of wreck area, Time is #62), 7 & 8 (newspaper articles, wreck image at 2nd link), 9 ('convoyweb.org' WW2 convoy duty, select Time, said to be British), 10 (Miramar, link, you now must be registered to access). 103.6 metres long perpendicular to perpendicular, single screw, speed of 12 knots, signal letters THLK. Built for 'Australian Steamships Limited', owned & managed by 'Howard Smith Co. Limited', of Melbourne, Australia (collectively 'Howard'). Howard provided coastal shipping services throughout Australia. Albert Brew, who supervised Time's construction, delivered her to Australia & served as her Master for a while. Have seen the vessel described as an ore ship. I suspect that the vessel saw local service in WW2, having never left Australian waters - correct? WW1? 49 WW2 convoy references, all Australian coastal. On Aug. 23, 1949, the vessel was wrecked, Captain McClenaghan in command, on Corsair Rock (8 ft. of water), at the entrance to Port Phillip Bay, Victoria, Australia. Have not read the full circumstances. Can you tell us? However I read that the entrance to Port Phillip is via the most shallow 'The Rip', a one kilometre wide stretch of water flanked by reefs - very often turbulent. Many ships have foundered in the area & specifically on Corsair Rock at the outer end of Nepean Reef. Time's steering failed after she was struck by heavy seas entering The Heads in the early hours of Aug. 23, 1949. She carried onto the reef. Her salvage rights & cargo were bought by a local consortium of 8 people. The cargo - 3,000 tons of sugar, timber, coal, hides & other goods - was salvaged & the vessel's equipment & fittings were auctioned off at nearby Queenscliff. No loss of life. She survived the pounding seas for many years - & looked as though she was merely at anchor. Explosives were used in 1959, to make her look like a wreck - for the movie 'On the Beach'. On Good Friday, 1960, the vessel slipped from the rocks into deeper water. Wreckage, at 38.3S/144.6E, is widespread on the northern side of Nepean Reef - but is rarely dived due to her treacherous position. A museum at Queenscliff, Victoria, has many photographs & relics on display. Can you add anything? Images? A cargo ship. Per 1 (Board of Trade inquiry ref. ), 2 (W. E. Hinde & Co., 50% down), 3 (Miramar, link, you now must be registered to access). 88.5 metres long, perpendicular to perpendicular, 290 ft. long overall. Built for Trident Line Ltd., (Pardoe-Thomas & Co., the manager), of Newport, Wales. The vessel was sold, in 1920, to W. E. Hinde & Co., of Cardiff, Wales, & renamed Portgwarra. Portgwarra? A tiny coastal village on the Penwith Peninsula, in Cornwall. On Dec. 31, 1921, while en route from Blyth, Northumberland, to Rotterdam, with a cargo of coal, the vessel ran aground & foundered 11 miles WSW of the Maas lightship. I have not spotted exactly where that was, but clearly it was near the Hook of Holland (Hoek van Holland). The lightship is now long gone. It would seem there was a Board of Trade inquiry in 1922, presumably into the sinking. Any loss of life? In Apl. 2011, thanks to Jan van Leest, of the Netherlands, we can tell you a little more. It would seem that there likely was no loss of life back in 1921, since the crew of Portgwarra made it to the Maas light vessel from which they were rescued by steam Pilot Cutter #10 of Rotterdam. Indeed, the British Government awarded a fine cup to Cornelis de Geus, the Master of that cutter, as you can see in the fine image at left. Jan's interest? In the summer of 1969, as a professional diver, Jan worked aboard Magnus 8, a 'sheerleg' salvage ship of Ulrich Harms of Hamburg. The Dutch Government had ordered that all obstacles laying higher than 31 meters above the seabed were to be removed in order to provide deep draught vessels with safe access to Maasvlakte & the port of Rotterdam. The name of Portgwarra could clearly be read on a wreck that Jan found near 'Maasboei 18' in the North Sea. It was generally in poor condition, draped with fishing nets & other debris, lying upside down on & in the sea bottom with its propeller & rudder pointing upwards. A rear section of the wreck, of some 300 tons, was however intact & was hoisted clear. It contained the ship's galley & an interesting looking brass pump that you can see here. Should you wish to know more of that pump, you may contact Jan via the webmaster. Jan we thank you! Now I stated above that there likely was no loss of life when Portgwarra foundered. I now learn that is not so! Adrian Green has provided (thanks!) an officially certified copy of an entry in the 'Marine Register of Deaths at Sea'. Which states that D. (Daniel) Green ('Green'), Adrian's great grandfather, then a 66 year old steward aboard Portgwarra, was drowned that day. Adrian adds that Green is buried at 'Ouddorp cemetery Row H no. 15.' Could there have been others? WWW data about the vessel is essentially non-existent. Can you add anything additional? The 1922 Enquiry report? An image of the ship? Alan Wright, of U.K., has been in touch & wishes to access a crew list for the vessel's final voyage - believing that his wife's grandfather may have been aboard. Should you have such a list do be in touch with the webmaster, who will gladly forward any data received to Alan. A cargo ship. Per 1 [Neptune Steam Navigation, Malvern Range (2)], 2 (K Steamship, Kambole), 3 [Stanhope Steamship, Stanthorpe (1)], 4 (Miramar, link, you now must be registered to access). 115.8 metres long perpendicular to perpendicular, 380.0 ft., single screw, speed of 8 1/2 (or 10) knots. Built for 'Neptune Steam Navigation Co. Ltd.' of Liverpool, Furness, Withy and Co. Ltd. the managers. In 1922, the vessel was sold to 'K Steamship Co. Ltd.', of London, 'Kaye Son and Co. Ltd.' the managers, & renamed Kambole. On Sep. 1, 1928, Kambole arrived at London ex Buenos Aires with a cargo of grain. There was likely a collision with Sun VIII, a tug I think, but the Google data 'snippet' ex Lloyd's List Law Reports is fragmentary so I cannot tell you what exactly happened or the decision. A second tug was also involved, Sun IX. On Apl. 29, 1937, the vessel was sold to 'Barry Shipping Co. Ltd.', of London, 'B. and S. Shipping Co. Ltd.' of Cardiff, the managers, with no change of vessel name. A day later, on Apl. 30, 1937, the vessel was sold to 'Stanhope Steamship Co. Ltd.', of London, 'J. A. Billmeir and Co.' the owners & managers, & renamed Stanthorpe. In 1938, the vessel was sold to Oscar E. Bertin ('Bertin'), of Shanghai, China, & renamed Yolande Bertin. Served in Eastern waters while registered in France. In 1941, the vessel was transferred by Bertin to 'Panamanian Freighters' of Panama City, Panama, Wallem and Co. of Hong Kong, the managers, & renamed Honduras. And in 1946, was registered in the name of 'Cargueros Panamenos SA', with no change of vessel name. In 1947, the vessel was sold yet again, for about $250,000, to E-Hsiang Steamship Co., of Keelung, China, & renamed Foo-Hsiang. Became Taiwan registered in 1949? On Nov. 9, 1953, the vessel arrived at ship breakers at Osaka, Japan, to be broken up. The above text likely needs correction. This Australian site seems to link the ship, when named Honduras, with 'Broken Hill Proprietary Company Limited'. Can anyone explain that. Or add anything? A cargo ship, probably a collier. Per 1 (over 80% down #10, Iron Chief), 2 (Iron Chief), 3 (Maindy Shipping, 1922, 80% down re Maindy Lodge), 4 (Miramar, link, you now must be registered to access). 290 ft. (about 93 metres) long. Built for 'Tree Steamship Co. Ltd.' (H. Jones & King the managers), of Cardiff. In 1920, the vessel was sold to Maindy Shipping Company Ltd., known as 'Maindy Shipping Line', also of Cardiff, ('Jenkins, Richards and Evans Ltd., the managers), & renamed Maindy Lodge. Registered at Sydney, New South Wales ('NSW'), Australia, which would seem to relate to the vessel being chartered for a year to 'Scott Fell & Co', of Sydney. Maindy went into liquidation in 1921, hence, in mid 1922, the vessel was sold to Interstate Steamship Company, (William Scott Fell the owner), the first fleet ship, & renamed Iron Chief. Acquired to serve the coal mines of Maitland Colliery in NSW. 0n Apl. 1, 1928, while en route from Port Stephens to Coffs Harbour (160 & 570 km. respectively N. of Sydney), with 10,000 railway sleepers (value �54,000), vessel struck Mermaid Reef, Crowdy Head, Port Macquarie, (400 km. N. of Sydney), NSW, & was beached near Diamond Head. Have not read any detail as to weather or other conditions. No lives lost. Ship a total loss & sold for scrap value of �160 only. Insurance monies paid for a replacement vessel to be built at Sunderland, also called Iron Chief. Can you add anything? A cargo ship. Per 1, 2, 3, 4 & 5 (re sinking), 6 (1941 image), 7 (image, Kowarra), 8 (Howard Smith), 9 (data), 10 (Lloyd's Register data, 1930/31 thru 1945/46), 11 (Miramar, link, you now must be registered to access). 270.0 ft. (about 87 metres) long, speed of 10 or 11 knots, signal letters JMBC, later VJFM. Built for 'Australian Steamships Ltd.' (Howard Smith the manager), of Melbourne, Australia, which company in 1914 became 'Howard Smith Limited'. The vessel was requisitioned by the British Admiralty, 1916/19, for use as a collier. It would seem that the vessel was later sold since in 1943 references are to either 'Australasian Steam Navigation Company' or 'Australian Steamships Proprietary Ltd.' ('Proprietary') being the then owner. Certainly Proprietary is the registered owner as & from 1930/31 as per link 10. On Apl. 24, 1943, defensibly armed, while unescorted & en route from Bowen to Brisbane (both Queensland) with a cargo of sugar, the vessel was sunk by two torpedoes fired by Japanese submarine I-26, under the command of Minoru Yokota, off Sandy Cape Lighthouse, Fraser Island, Australia (60 km. NE of Sandy Cape, Queensland). It would seem that 2 Japanese submarines surfaced after the attack. Sunk at 24.26S/153.44E. 21 lives were lost including D. McPherson, Kowarra's captain, & a gunner. But I have also read, at Trove, Australia, that 24 lives were lost. 11 survivors were, by a stroke of good fortune, picked up from a raft on Apl. 25, 1943 (2 had died overnight) by SC-747, a Subchaser attached to the U.S. 7th fleet, then engaged in escorting a convoy from Moreton Bay, near Brisbane, to Townsville in northern Queensland. Survivors were delivered to convoy vessel Van Vlissenberg, which was carrying Australian troops, & were landed at Townsville. Les Record, a survivor just 17 years old, was found naked but wearing a wrist watch - "the thing stopped" he said "and it was sold to me as waterproof"! There are 10 images of the wreck of a vessel said to be named Kowarra at this link, on the beach at Fraser Island. Here is the first of those images - follow 'next' to see the others. But I think, since Kowarra was sunk 60 or so km. away, it cannot be 'our' Kowarra, though stated to be sunk by the Japanese. Rather, I think, the wreck is of the Maheno. Kym McKay has been in touch to advise that her grandfather, Leslie Record, was one of the Kowarra survivors, found along with Jack Finnan & others on a life raft. Kym advises me that Leslie along with three later generations of his family are to visit the sinking site in Jun. 2013 & hope to hold a family memorial ceremony at the approximate sinking site. How wonderful! It would seem that a wreck was located on the sea bed some years ago by Trev Jackson, that may be Kowarra. Can anybody update us on that matter? Or add anything more? A cargo ship. Per 1 (Clare Lilley), 2 & 3 & 4 (all wreck related - brief ref. 60% down on 4), 5 (image of Clare Lilley), 6 (Miramar, link, you now must be registered to access). 350 ft. (106.7 metres) long, speed of 8 1/2 knots. Built for John Priestman of Newcastle. Renamed Eastcliffe in 1919. And later in 1919 sold to 'Ivar An Christensens Rederi A/S' (I. A. Christensen managers), of Kristiania (Oslo), Norway, & renamed Modig. In 1923, owned by 'A/S Ivarans Rederi', of Norway, (same managers). Sold 1934 to Clare Shipping Co. Ltd., of London, & renamed Clare Lilley. Involved in WW2 convoy duties from N. America to U.K. On Mar. 17, 1942, while i) en route from New York to Liverpool via Halifax with a cargo of bombs & ammunition, and ii) awaiting a Halifax pilot, vessel ran ashore in bad weather at Black Rock Point, nr. Portuguese Cove, at the entrance to Halifax Harbour, Nova Scotia, Canada. Vessel broke in two. 5 crewmen lost. Some crew members were saved due to the efforts of Burt Spencer, a local resident, who repeatedly dove into the waters between the wreck and the shore pulling men to safety. Others were maybe saved by HMC ML053, a naval craft which stood by the wreck and may have been the vessel that rescued crew and the ship's cat. The munitions were largely removed from the wreck in the 1970s, & in the summer of 1999 the rest was removed (Trident, Mar. 07, 2005, p.22). Can you add anything? A cargo ship. Per 1 (Ellis Island, New York, insert Maindy Court), 2 (Norman Wisdom obituary), 3 (Maindy Shipping, 1922, 80% down re Maindy Lodge), 4 (Lloyd's Register Data, 1930/31 thru 1937/38, ex 'plimsollshipdata.org' the source of the Lloyd's data at left), 5 (image, Maindy Court), 6 (Miramar, link, you now must be registered to access). As this page is updated, an image of Maindy Court is available on eBay. Forgive me when I invite you to find it for yourself - I prefer not to 'reward' vendors by providing a link to images which bear excessive logos. 106.7 metres long perpendicular to perpendicular, 350 ft., signal letters EPC & later in life, JQKH & SVLM. Built for Maindy Shipping Company Ltd. ('Maindy'), known as 'Maindy Shipping Line', of Cardiff, ('Jenkins, Richards and Evans Ltd., the managers). A large crew, or so it seems to me at least. 2 arrivals at New York are recorded, in 1917 & 1924, with crews of 37 & 33 respectively. Is not that a large crew? Geoffrey Donnelly then the Captain. It would seem that an 'order of arrest' was issued in Germany against the vessel in 1921. I have read no detail of the circumstances. Now Maindy went into liquidation in 1921, & the vessel was then sold, at auction, to Sir David R. Llewellyn, Bart. ('Llewellyn'), with James Rattary the manager. While the vessel was, it would seem, registered in the name of Llewellyn, the business operating name would seem to have then become 'Maindy Fleet of Steamers', however a company named 'D. R. Llewellyn, Merrett & Price, Ltd.', of Cardiff were clearly most closely involved, at least through 1926. It seems likely the vessel saw service in Australia & New Zealand ('NZ') in 1922. It certainly arrived with steel at Tauranga City, North Island, NZ, on Oct. 9, 1922 & visited Bunbury, West Australia. The vessel is notable perhaps because Norman Wisdom, comedian extraordinaire, later Sir Norman Wisdom ('Wisdom'), served aboard her in 1930 for 5 months, at age 15, as a cabin boy. He collected the princely sum of �10 for his service, to Argentina with coal & back to Rotterdam with grain & meat. It then had a crew, all told, of 28. Norman Wisdom died, at age 95, in Oct. 2010. Lynne Harding has advised (thanks so much Lynne! ), that her grandfather, Arthur James Thomas, MBE, (1891/1976) was the Captain of Maindy Court when Norman Wisdom served aboard her as cabin boy! He was her captain, in fact, for 7 years thru 1932. In 1957, the two met again during the taping of the TV show re Wisdom 'This Is Your Life' - image at left. Sir David R. Llewellyn, Bart. would seem to have owned the vessel until 1932, when it was sold to 'Fancott Shipping Company Ltd.', of London & Cardiff, W. T. & H. A. Williams, of Cardiff, the managers & renamed White Fan. For a short time only. In 1933, the vessel was sold again, to 'Pateras Bros.', of Piraeus, Greece, or maybe of Chios, Greece, & renamed Aegeus. On May 9, 1937, the vessel, en route from Gdynia, Poland, to Rosario (Argentina I presume), with a cargo of coal, was in collision, in dense fog, with Nashaba, a U.S. 6,062 gross ton cargo ship carrying (iron?) ore, at 54.51N/15.53E, (or at 54.37.5N/ 15.47.3E), 32 miles SE of the Danish island of Bornholm. And sank. No loss of life - the entire crew of 37 were saved by Nashaba & landed at Gdynia. Bornholm is located in the Baltic, far to the east of the rest of Denmark. Rather between Sweden & Poland. I have not been able to read the full circumstances. Nashaba leaked as a result but surely survived the encounter & later, on Feb. 26, 1945, hit a mine & sank in the Schelde estuary. The webmaster cannot recall the original source, now many years later, of the alternate location of the collision provided above i.e. 54.37.5N/15.47.3E. Do be in touch if you have any information about the matter or can provide a detailed account of the May 1937 collision. Can you add anything? Another image? A cargo ship. Per 1 (Maindy Shipping, 1922, 80% down re Maindy Lodge), 2 (ref. Fancott), 3 (Miramar, link, you now must be registered to access). 106.7 metres long, perpendicular to perpendicular, radio letters EPB. Built for Maindy Shipping Company Ltd. ('Maindy'), known as 'Maindy Shipping Line', of Cardiff, ('Jenkins, Richards and Evans Ltd., the managers). While I have read no detail, there was a 'High Court of the Admiralty' court case in 1920 involving Frodingham. Likely this one, also built at Sunderland (Osbourne, Graham). The vessel clearly spent time in the Australia & New Zealand ('NZ') area. I read a ref. to the vessel carrying 'Ephos' fertiliser from Safaga, Egypt, Red Sea, to Lyttleton, NZ. Now Maindy went into liquidation in 1921. The vessel was acquired by Sir David R. Llewellyn ('Llewellyn'), of Newcastle - with James Rattary of Cardiff likely the manager. Llewellyn had acquired ten Maindy steamers at auction, including Maindy Manor, for a total of �290,000. While I have read no detail, it would seem that at an (unknown to the webmaster) date in 1932, Maindy Manor went aground in the Paran� River, Argentina. Eastgate, trying to avoid Maindy Manor, went aground also. A 1933 court case, of some significance in maritime law, resulted. In 1932, the vessel was sold to 'Fancott Shipping Company Ltd.', of London & Cardiff, W. T. & H. A. Williams ('Williams'), of Cardiff, the managers, & renamed Bright Fan. The vessel was registered at London. On Sep. 25, 1932, the vessel left Churchill, Manitoba, for London, with a cargo of 252,992 bushels of wheat. At 4:40 a.m. on Oct. 1, 1932, (a number of most authoritative sites incorrectly state Oct. 1, 1935), in fine weather, the vessel hit the underwater edge of a 'growler' iceberg & foundered, about 25 miles NE of Wales Island, 'near Wakeham Bay'. Travelling at 6 1/2 knots at the time, it sank 3 hours later. At 62.12N/71.20W (or 62.15N/71.39W), in Hudson Strait, North West Territories, Canada. The vessel had obsolete charts (do see below), was off course, had no gyro compass (it's magnetic compass was inoperative due to the proximity of the magnetic pole) & no proper lookout was being maintained at the time of the collision. The Court of Inquiry, held in Ottawa, determined that 'a good and proper lookout was not maintained'. The crew was rescued by N. B. McLean, a Dominion of Canada ice-breaker. I read, amazingly, in a data 'snippet', that the charts that Bright Fan carried were charts that had been condemned by Hudson's Bay Company back in 1814! Can you add anything? An image? A cargo ship. Per 1 (ref. to sinking, Embiricos Nicolaos, Mar. 21, 1941), 2 (Convoy AS.21), 3 (Miramar, link, you now must be registered to access). 111.2 metres long, perpendicular to perpendicular (365.0 ft.), speed of 9 1/2 knots. Most sites refer to a gross tonnage of 3798. Built for 'Sun Shipping Co. Ltd.', Mitchell Cotts & Co., the manager, both of London. In 1934, the vessel was sold to 'Cephalonian Maritime Co. Ltd.', 'N. D. Lykiardopulo', of Athens, Greece, the managers, & renamed Daphne. In 1939, it was sold again, to G. N. Embiricos, also of Greece, & renamed Embiricos Nicolaos. Only 1 WW2 Convoy reference, AS.21 as above. On Mar. 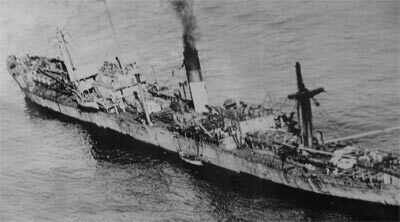 21 (or 22 or 23, data differs), 1941, while en route, in ballast, in Convoy AS.21, from Piraeus, Greece, to Port Said, Egypt, the vessel was hit by bombs dropped by German aircraft. And sank. At 34.30N/24.45E, 20 miles S or SE of Gavdo or Gavdhos Island, S. of Crete, by II/KG 26 He 111 or Ju 88 (per German sites) torpedo bombers. 2 lives were lost. Can you add anything? A cargo ship. Per 1 (45% down Cate B), 2 (data & image, Norwegian page), 3 (Norvik 1st battle), 4 (hits Apl 9 & 10, 1940), 5 ('doc' file #52, alas link seems dead, hopefully it will resurrect), 6 (image of Cate B), 7 (page in Norwegian which relates to Cate B & Norvik), 8 (Miramar, link, you now must be registered to access). 365.9 ft. long, speed of 9 1/2 knots. 1917 ordered by 'Torp & Wiese', of Bergen, Norway but sold (Nov. 1919) before being built to 'Rederi A/B Transatlantic' (G. Carlsson managers? ), of Gothenburg, Sweden to whom she was later delivered. In Jun. 1938, sold to Th. Br�vig, of Farsund, Norway, & renamed Cate B. On Apl. 8, 1940, vessel (Captain Birger Larsson-Fedde) was at Narvik, northern Norway. And in harbour when German vessels attacked Narvik (& many other places in neutral Norway), to control marine routes from Germany to the North Sea & North Atlantic & also control access to the iron mines of northern Sweden. On Apl. 8, 1940, 10 German destroyers attacked Narvik. Cate B rescued 16 men from Norge, that day, I read. The British responded quickly & on Apl. 10, 1940 the 2nd Destroyer Flotilla arrived at Narvik to the surprise of the Germans. 2 German destroyers in harbour were sunk & 3 heavily damaged. 6 merchantmen were also sunk. Not the end of that engagement, however. The data re Cate B is however confusing. It would seem that Cate B was one of the 6 merchant vessels then sunk. But other sites say that only 3 days later, i.e. on Apl. 13, was she hit by a torpedo from destroyer Z-18 (Capt. Hans L�demann) & by shells & a torpedo from an unnamed British destroyer, & sank after 12 hours. The crew escaped to shore between the torpedo hits. One site says she was scuttled on Apl. 10, another references her not being sunk until Apl. 18, which seems a bit unlikely. The most detailed data is at 1. That is not the end of the story! The vessel was salvaged, in 2 parts apparently, by 'Norsk Bjergningskompagni A/S', in 1955 it would seem, but maybe not since this page says 1953. She was broken up at Stavanger, Norway, in 1955, by 'Stavanger Skipophugnings Co.' A large portion of the available data is in Norwegian, a most difficult language for the webmaster to understand & to WWW translate. Can you add anything? A cargo ship. Per 1 (Morrison Steamship, Nestlea), 2 ('plimsollshipdata.org', Lloyd's Register data, 1930 thru 1940, Nestlea), 3 ('convoyweb.org', WW2 convoy duty, click on 'SHIP SEARCH' then insert Nestlea), 4 (Convoy SL-53S, select the convoy at left), 5, 6, 7 & 8 (data related to Nestlea sinking), 9 (Mary Stanford, ref. Nestlea in table of dates, Nov. 1940, 75% down), 10 (Miramar, link, you now must be registered to access). Corrections to the data that follows may well prove to be necessary. 111.2 metres long perpendicular to perpendicular, 365.0 ft., speed of 9 1/2 or 10 knots, signal letters KJHF & later GFZK. The vessel was launched, back in 1917, as Lifjeld for H. G. Martens, which would seem to mean Harald Grieg Martens, of Bergen, Norway. Can anybody tell us what happened to that transaction? Only rather later, in May 1921, was the vessel completed and, renamed Nestlea, became owned by its builder i.e. J. Priestman & Co. At a later unknown date, the vessel became owned by John Priestman personally, with J. Morrison & Son ('Morrison'), of Newcastle, the managers - as is recorded in the Lloyd's Registers of 1930/31 thru 1934/35 - at left. In the 1935/36 edition of Lloyd's Register, 'Cliffside Shipping Co. Ltd.', a company owned by Morrison, had become the vessel's owners with Morrison still the manager. I have read little about its service record, only that amongst its cargoes were coal, maize & palm kernels. On Jul. 22, 1928, the vessel struck a pier at Cape Town, South Africa. On Nov. 5, 1931, Swansea trawler Radnor came to the assistance of Nestlea, which was then in distress, with, I think, its steering gear damaged in a major storm. Boiler & engine work was effected, at Barry, Wales, in 1936. Somewhere along the line, the vessel became 'fitted for oil fuel'. Just 4 WW2 convoy references. On Oct. 25, 1940, the vessel would appear to have left Freetown, Sierra Leone, in convoy SL.53 bound for Liverpool, with a cargo of manganese ore ex Takoradi (i.e. 'Sekondi-Takoradi', Ghana, W. Africa), bound for Workington. Strange to say, the vessel was a straggler. Why do I say that? It seems to be unusual that the vessel which carried the convoy's Commodore, in fact the Master of Nestlea, (his name? ), was a straggler in his own convoy. The convoy started as 7 ships & became 9 when 2 vessels later joined the convoy. The convoy certainly hit bad weather. On Nov. 18, 1940, the vessel was bombed & shelled by a Condor aircraft of the German Luftwaffe. At 50.38N/10.00W, which I have read described as in the Irish Sea, WSW of Old Head of Kinsale, a headland near Kinsale, County Cork, Ireland. However 65 or so miles roughly S. of Fastnet Rock, at the SW tip of Ireland seems to better define the sinking location. I have not read the detailed circumstances but read that the crew & one gunner, 39 in total perhaps, were all saved. The ship was abandoned by its crew - Birch, a Royal Navy trawler, was sent, on Nov. 18, 1940, to search for & rescue survivors from the ship but found it low in the water & totally abandoned. It presumably sank later. On Nov. 19, 1940, Mary Stanford, a 'Royal National Lifeboat Institution' lifeboat based at Ballycotton (S. coast of Ireland 25 miles E. of Cork) landed 22 survivors ex Nestlea & 'rescued a (Nestlea) boat' on Nov. 20, 1940. Did that second boat contain the other 17 survivors or was another rescue vessel involved? Can you tell us? The Nestlea sinking is the subject of a chapter ('A Brush with a Condor') in 'Beware the Grey Widow-Maker: The Ongoing Harvest of the Sea', published in 2004 (or maybe in 2002) & written by Bernard Edwards. But do 'beware' that title. Bernard Edwards wrote also a quite different book entitled 'The Grey-Widow-Maker', a book that the webmaster acquired by mistake. Can you add to or correct the above? Perhaps provide the 'Edwards' Nestlea chapter text. An image of the vessel? A cargo ship. Per 1 (data 50% down, '8th November 2007' Inchkeith), 2 (Inch Steamship, Inchkeith), 3 ('Thursday, 14 August', Stella), 4 (Planet), 5 (Convoy SC99), 6 ('plimsollshipdata.org', Lloyd's Register data, 1930/31 thru 1944/45, Empire Planet), 7 (Miramar, link, you now must be registered to access). 365 ft. (about 115 metres) long, speed of 9 knots, signal letters KPBT, later IBHH & BDTC. Built as Barbara, it would seem, though that name not referenced at 8. But Barbara may be incorrect - I have no access to Lloyd's Register of the time to determine for myself its initial registered name. Built for Cliffside Shipping Co. Ltd., which company was owned by John Morrison & Son of Newcastle. In 1924, the vessel was renamed Barbara Marie. In 1924 (or maybe in 1925) the vessel was sold to Sea Steamship Co. Ltd (Brown Atkinson the manager? ), of Sunderland perhaps, & renamed Portsea. It was sold, in 1933, to 'Nivose Soc. di Nav', of Italy (A. Scinicartello the manager? ), & renamed Cipro. And sold, in 1937, to Bargio Borriello, 'Lauro & Montella' the managers, of Naples, Italy, & renamed Stella. On Aug. 14, 1941, Stella, out of Recife, was captured by armed merchant cruiser Carcassia, W. of Cape Verde Islands. At 24.55N/40.23W (ref. doubtful). Sent with a prize crew to Bermuda. Soon renamed Empire Planet for Ministry of War Transport, managed by Golden Cross Line of Cardiff. Spotted a single ref. to convoy duty in WW2, Convoy SC99 from Halifax to Liverpool on Sep. 6, 1942. In 1947, the vessel was sold to Williamson & Co. ('Williamson') of Hong Kong (or maybe to Inch Steamship Company Ltd., a subsidiary of Williamson), & renamed Inchkeith. On Mar. 2, 1955, the vessel ran aground at Andaman Islands, Bay of Bengal. At 12.01N/92.47.30E. Vessel a total loss. Can you add anything? Another image perhaps? A cargo ship. Per 1 (data), 2 (wreck site), 3 ('convoyweb.org' WW2 convoy duty), 4 (image), 5 (Miramar, link, you now must be registered to access). 245 or 254 ft. (about 80 metres) long, 74.7 metres perpendicular to perpendicular. Built for Enfield Steamship Co. Ltd. (S. Marshall & Co. the managers), of Sunderland. 16 WW2 convoy references, all U.K. coastal & mainly Tyne to Southend (for London). I am unable to access the independent WW2 voyages. On Aug. 8, 1940, while en route from Portsmouth to the Clyde in ballast, the vessel was bombed, strafed & sunk by German Stuka aircraft, 15 miles W. of St. Catherine's Point, Isle of Wight. The wreck lies in 35/40 metres of water at 50.30.0N/01.40.2W. Can you add anything? Another image perhaps. A cargo ship. Per 1 (Morrison Steamship, Eastlea), 2 ('plimsollshipdata.org', Lloyd's Register data, 1930 thru 1940, Eastlea), 3 (data, Eastlea), 4 ('pdf', extensive data, ATKINSON, p 5/7, but pages not numbered. About 10% down), 5 ('uboat.net', sinking, Eastlea), 6 (U-106), 7 ('convoyweb.org', WW2 convoy duty, click on 'SHIP SEARCH' then insert Eastlea), 8 (Miramar, link, you now must be registered to access). 111.2 metres long perpendicular to perpendicular, (365 ft.), speed of 10 knots. Built for Cliffside Shipping Co. Ltd., which company was owned & managed by John Morrison & Son of Newcastle. Vessel registered at Newcastle. Just 2 WW2 convoy references, both in the eastern Mediterranean. The vessel was reported missing on Mar. 24, 1941. On Mar. 24, 1941 (carrying cotton seed & 'possibly' a part of convoy HX-115), & on the St. Vincent, Cape Verde Islands to Newport News, Virginia, leg of a Cyprus to Newport News via S. Africa voyage, the vessel was torpedoed & sunk by a German submarine. But link 7 says travelling independently. At approx. 130 miles WNW of San Antonia, Cape Verde Islands. All 37 aboard, including Captain M. (Malcolm) Goudie McPherson were lost. Two of the above links indicate that U-106 was the German submarine involved. But 4 indicates that there are references that state it could well have been U-48. Sites also say that the vessel was lost on Mar. 30, 1941 which seems unlikely since the vessel had left St. Vincent on Mar. 23, 1941. Can you add anything? An image perhaps. A cargo ship. Per 1 (Morrison Steamship, Westlea), 2 ('convoyweb.org' WW2 convoy duty, Becheville), 3 (Mulberry Harbours, Becheville, Gooseberry #5, low on page), 4 (French page, Becheville), 5 (data, 50% down, Becheville), 6 (extensive French 'pdf' re Mulberry Harbours, Becheville, #62, 80% down document), 7 (1931 grounding), 8 (Miramar, link, you now must be registered to access). 111.2 metres long, perpendicular to perpendicular, (377 ft. 3 in. ), speed of 9 or 9 1/2 knots. Built for Cliffside Shipping Co. Ltd., which company was owned by John Morrison & Son of Newcastle. Vessel registered at Newcastle. The vessel was sold, in 1927, to 'Tyneside Line Limited', 'John Ridley, Son & Tully', of Newcastle, the owners & managers, & renamed Newton Elm. 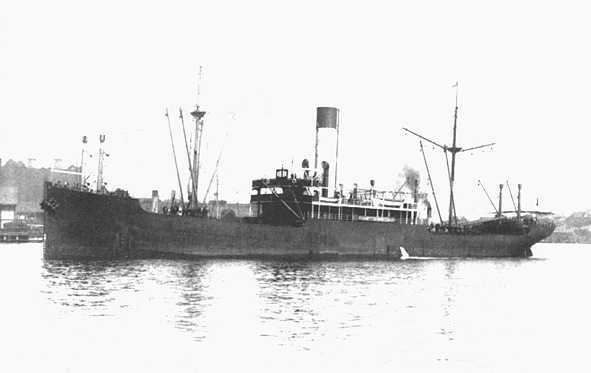 On Dec. 18, 1931, the vessel ran aground near Crescent Head, 180 miles N. of Newcastle, New South Wales, Australia, while en route from Newcastle to London via Sydney, with a cargo that included huge cables, presumably manufactured at Newcastle Steelworks, for use in the construction of the Sydney Harbour Bridge. The vessel was refloated & repaired at Sydney. In 1937, the vessel was sold again, to 'Arlon Steamship Co. Ltd.', of London, James German & Co., of Cardiff, the managers, & renamed Becheville. The vessel was perhaps armed at Cardiff. As this listing is uplinked, I am denied access to WW2 convoy data at 'convoyweb.org'. But I understand that there are 66 WW2 convoy references. Many U.K. local refs. but also 8 N. Atlantic crossings, service in Norwegian waters, & to Seine Bay, France, in Jun. 1944 re the Normandy landings (see following text). When the vessel arrived at Liverpool from Halifax, Canada, on May 10, 1941 (convoy SC30) the vessel was involved in a collision. Have read no details. Carried steel & scrap on a few voyages. In 1944, the vessel was requisitioned by the Ministry of War Transport, with Christian Salvesen & Co., of Leith, Scotland, the managers. It maybe was transferred to the Admiralty on Feb. 8, 1944. The vessel left Poole, Dorset, on Jun. 6, 1944 in convoy 'Corncob 1', for France, & arrived off the Normandy coast on Jun. 7, 1944. It was scuttled, on Jun. 9, 1944 - sacrificed to form part of a breakwater for a 'Mulberry Harbour' on the coast of Normandy. The specific breakwater was 'Gooseberry 5', located at & off Sword Beach, at Ouisttreham, Normandy. I have seen many references, however, to the vessel being sunk on Feb. 8, 1944. Can anybody clarify that date? And explain the ref. to 'Oregon Steamship Co. Ltd.' here. Can you add anything? Another image perhaps. I read that 'From 70 North to 70 South' by Graeme Somner, contains an image of Becheville. A cargo ship. Per 1 (Morrison Steamship, Gaunless, but the data seems to be partially in error, the Oct. 28, 1941 sinking was a different vessel), 2 (extensive data, Ule�, Inger), 3 (Miramar, link, you now must be registered to access). 254 ft. 2 in. long overall, 74.7 metres long perpendicular to perpendicular, (244 ft. 1 in.) speed of 8 1/2 knots. Built for 'Skibs-A/S D/S Boreas', 'Torp & Wiese' the manager, both of Bergen, Norway. Ron Beaupre advises (thanks! ), that the vessel sailed to the Great Lakes in 1928-1930. In 1933, the vessel was sold to John Morrison & Son of Newcastle, & renamed Gaunless. A name that looks like a spelling mistake! But I am corrected. It is, I learn, the name of a river which flows into River Wear near Bishop Auckland, Durham. In 1937, the vessel was sold again, to 'O/Y Finska Insjj� Ab.' ('Insj�'), of Helsingfors (Helsinki), Finland, & renamed Ule�. Registered at Helsinki, then Viipuri (Vyborg, Russia), & then Helsinki again. A number of managers, it would seem, while Insj� owned the vessel - Ernst Sohn, Birger Carrell, Ab Edv. Bj�rklund Oy, & Birger Carrell again, but also referenced is F. Nichols & Son (but not at 2). There is, of course, no allied WW2 convoy data at 'convoyweb.org' re 'our' Ule�. Can anybody tell us about her WW2 service? In 1947, the vessel was sold to 'Rederi Ab Inger', A. H. Vang the manager, both of Helsinki, & renamed Inger. It would seem to have been sold or transferred, in 1948, to 'Rederi Ab Ergo', also of Helsinki, with no change of name. It was sold for the last time, in 1955, to the USSR, & renamed Kharlov. It would seem that the vessel may have ended its days in 1957 - but it was deleted from the lists only in 1970, however. Can you add anything? Another image perhaps? A cargo ship. Per 1 ('uboat.net' data, Newton Pine), 2 (data re sinking, in article re John Alexander), 3 & 4 (U-410), 5 (Graig Shipping, 48% down), 6 (image, Newton Pine, with data), 7 ('convoyweb.org' WW2 convoy duty, Newton Pine), 8 (Morrison, Fernlea, refers to U-704), 9 (U-65), 10 (Miramar, link, you now must be registered to access). 111.2 metres long perpendicular to perpendicular (377 ft. 3 in. ), speed of 9 or 9 1/2 knots. Built for Cliffside Shipping Co. Ltd., which company was owned by John Morrison & Son of Newcastle. Vessel likely registered at Newcastle. The vessel was sold, in 1927, to 'Tyneside Line Limited', 'John Ridley, Son & Tully', of Newcastle, the managers, & renamed Newton Pine. On Oct. 20, 1927, the vessel, Donald McNicoll in command, was in collision with Canadian Runner, near Rimouski, Quebec, Canada, off Father Point, St. Lawrence River. Have no detail about the matter, other than i) that Newton Pine would seem to have been at fault. At the later inquiry, McNicoll was stated to have 'erred grievously in judgement' & ii) that Canadian Runner made it to Rimouski & was beached there & iii) a major storm was in the area at the time. Visited Auckland, New Zealand, 3 times between Jul. 1929 & Feb. 1932. Boiler repairs at Barry in 1937. 48 WW2 convoy references, mainly U.K. local, including perhaps 5 N. Atlantic crossings, & service to Freetown (W. Africa) & Gibraltar. On Nov. 27, 1940, Newton Pine left Buenos Aires, Argentina, with grains for the U.K. On Dec. 13, 1940, German U-boat U-65, Korvettenkapitan Hans-Gerrit von Stockhausen in command, fired a torpedo at the vessel, then 650 miles SW of Freetown, W. Africa. U-65 soon surfaced & a gun battle ensued. U-65 fired about 30 times & damaged but did not sink Newton Pine, which in turn fired many times. Newton Pine believed they scored a direct hit with their 20th & 21st salvos, & the submarine broke off the engagement & submerged. U-65 was not seen again. Newton Pine believed they had sunk U-65. Apparently the Ministry of Shipping agreed with that since 'prize money' was distributed to the entire crew of Newton Pine, based perhaps upon the value of the submarine to the Admiralty. We thank Sandy Davison for data re the battle. Sandy's father, John Davison was aboard Newton Pine that day, indeed was her Chief Officer, & received his share of the prize money in May 1941. U-65 did not sink. It tried to find Newton Pine again but did not succeed. It later was sunk with the loss of all hands, on Apl. 28, 1941. So there is only partial truth in the reference to the matter that I saw here. Sandy's full message can be read below should you wish greater detail. But before we leave the subject, we have a puzzle indeed. 'u.boat.net' has extensive references to U-65 but the data makes no reference to the Dec. 1940 attack upon Newton Pine. In 1941, the vessel was sold to 'Graig Shipping Company', 'Idwal Williams & Co.' the managers, of Cardiff, Wales. On Mar. 31, 1942 the vessel ran aground at Black Midden, Tynemouth. It was re-floated on Apl. 1, 1942, likely with the help of tugs. In Aug. 1942, the vessel delivered to Hull, grain & other cargo loaded at Halifax, Nova Scotia, Canada. On Sep. 26, 1942, the vessel left Hull, with Evan O. (Owen) Thomas ('Thomas') in command, in ballast, for Halifax. It left Loch Ewe, NW Scotland, on Oct. 3, 1942, & joined W. bound convoy ON-136. Newton Pine became separated from the convoy, on Oct. 11, 1942, due to a storm. Newton Pine was alone, when at 10.29 a.m. on Oct. 15, 1942, it was torpedoed & sunk by U-410, Kapit�nleutnant Kurt Sturm (1906/1987) in command. Roughly at 55.00N/30.00W. Have read that is SE of Cape Farewell, S. tip of Greenland, but it is essentially in mid Atlantic. All 47 aboard, including the Captain, were lost. It would seem that 25 or 30 survivors at least took to lifeboats. But did not make it to safety. A list of all of the 47 names of the lost has been kindly provided to the webmaster by Celia Newman-Barker, mainly the 40 names recorded on Panel 73, of the Tower Hill Memorial, in London. Hence the ref. to 'Thomas' above being in command rather than Daniel W. (Wright) Fowle as at 1. Many references to it being lost on Oct. 16, 1942. There would seem to be more to the history of this vessel but the detail eludes me. The vessel is reported (7), to have sunk in the North Sea, after hitting a mine. But when? And sunk? If so, resurrected, I presume. In both cases, it would be good to locate additional detail. Can you add anything? A cargo ship. Per 1 ('uboat.net', 1940 sinking), 2 (sinking, those who were lost), 3 ('convoyweb.org' WW2 convoy duty, insert Frances Massey), 4 (Miramar, link, you now must be registered to access). 111.2 metres long, perpendicular to perpendicular, 365 ft., speed? Built for 'W. A. Massey & Sons, Ltd.' of Hull. 6 WW2 convoy references, including service to Mediterranean (Alexandria, Malta, Bone), U.K. coastal. The vessel travelling independently, left Milford Haven for Wabana, Conception Bay, Newfoundland, on May 15, 1940. On May 30, 1940, the vessel left Wabana, unescorted, for Glasgow, with 7,500 tons of iron ore ex the Wabana iron mines. Walter Whitehead was in command, & 35 were aboard all told, including a gunner. At 0.07 a.m. on Jun. 6, 1940, U-48, Kapit�n zur See Hans Rudolf R�sing in command, fired a torpedo at the ship, but missed. Two hours later, at 2.13 a.m., a second torpedo was fired. This shot did hit the ship 'in the foreship', & the ship sank within 30 seconds of the hit. An appalling loss of life - Captain Whitehead was the sole survivor, so 34 of the 35 were lost. Whitehead was picked up by HMS Volunteer, a Royal Navy destroyer. The sinking took place 14 miles NW of Tory Island (off the NW coast of Donegal, Ireland), at 53.33N/8.26W. I have indicated above that the vessel was sunk on Jun. 6, 1940, which date seems to me to be correct. But ... many sites state, that the sinking was, in fact, on Jun. 7, 1940. I could spot no contemporary document that would clarify the matter. Can you add anything? Another image perhaps? A cargo ship. Per 1 (data & image), 2 (30% down), 3 (1st image), 4 ('1939, 7 Ottobre' & image), 5 (ref. ), 6 (40% down), 7 (bottom), 8 (Miramar, link, you now must be registered to access). 380 ft. (or 367 ft. 4 in.) (112 metres) long, speed of 10 knots. Built for Cliffside Shipping Co. Ltd., which company was owned by John Morrison & Son of Newcastle. On the morning of Oct. 7, 1939, when en route from Cape Town, South Africa to U.K. with a cargo of crude sugar, vessel was captured by German raider Admiral Graf Spee about 1/2 way between Cape Town & Freetown, Sierra Leone. Ashlea was boarded, part of the cargo removed, the crew were transferred to Newton Beech & the vessel was scuttled. At 9.52S/3.28W, which looks to be east of Ascension Island in the South Atlantic. Newton Beech (many references, which I believe are all incorrect, to 'Newton Beach'), had been captured by Admiral Graf Spee two days earlier. Ashlea was, I read, captured 'by surprise and deception' - Captain C. Pottinger thought she was a French battleship. The Germans gained useful intelligence from Ashlea since her captain had failed to destroy his confidential instructions from the Admiralty. On Oct. 8, 1939, crew were transferred to Admiral Graf Spee & Newton Beech was sunk. On Feb. 16, 1940, they along with the crews of many other captured vessels, were rescued at J�ssingfjord, Norway. Many links relate to Graf Spee & Ashlea. Can you add anything? A cargo ship which later became a liquid petroleum gas (LPG) tanker. Per A (e-Bay image, Gasbras Sul), 1 ('warsailors.com' WW2 convoy data, Rio Novo, 2 images), 2 ('convoyweb.org' WW2 convoy data, Rio Novo), 3 (data, in Norwegian, image as Gasbras Sul), 4 (data & images, Rio Novo, & profile Ultragaz, about 25% down), 5 (data in Norwegian re 'Lorentzen'), 6 ('Esso' court case, Gasbras Sul), 7 (image, Gasbras Sul), 8 (Miramar, link, you now must be registered to access). 94.9 metres long, perpendicular to perpendicular, 325.0 ft. (also read 311.4 ft.), speed of 11 knots. The vessel was launched in May 1933 but was completed only in Feb. 1937. While the data is confusing, I believe it was then sold to 'A/S Sobral', of Oslo, Norway, with �ivind Lorentzen, of Oslo, the managers. Lorentzen & A/S Sobral were closely related, see 5, but the data is far too difficult for the webmaster to summarise. 18 WW2 convoy references, thru Sep. 1942, including at least 5 N. Atlantic crossings, & U.K. local. The webmaster is not permitted, however, to access 'convoyweb.org' data re independent voyages. A sailor fell overboard on Sep. 11, 1942, ex Convoy ON-125, was picked up but died. Later in WW2, the vessel would seem to have independently connected U.S. ports & Progreso, but there are many places named Progreso & I cannot tell you which one it was. �ivind Lorentzen, of Oslo, would seem to have managed the ship for its entire life. In 1949, the vessel was sold to L.P.G. Comp. (Companhia?) Inc., of Liberia & renamed Ultragaz. And converted into an LPG tanker to carry 1600 tons of propane, in pressurised tanks, at a pressure of 250 lb. per sq. in., from U.S. Gulf ports to Rio de Janiero, Brazil. The vessel must have later reverted to A/S Sobral ownership because, on Sep. 17, 1955, Gasbras Sul, (then owned by A/S Sobral), under charter to Tropical Gas Company, was at Esso Standard Oil S.A.'s sea terminal at San Jose, Guatemala. A 'Chubasco' storm hit with force 6 winds, & Gasbras Sul, with great difficulty, put out to sea to ride out the storm. In so doing, the ship's anchors damaged Esso's submarine pipeline to the extent of $62,733.17. The court held that Gasbras Sul was not responsible. In 1961, the vessel may have been sold, to 'Pansupco S.A.', of Panama, & renamed Mundogas Sul & again been converted, this time, (perhaps? ), to a refrigerated liquified petroleum gas carrier. The vessel was laid up in 1963 at Rio de Janiero. And in Aug. 1967, was broken up there. Data about the vessel is, to the webmaster, for language & other reasons, both difficult & confusing. If you can correct or add to the above, your contribution would be most welcome. Little more than a name and some dates today. 'Where Ships Are Born' advises us that John Robinson had shipbuilding yards at Hylton & at Ayres Quay. And that he built nearly a hundred ships between 1846 & 1868 - all wooden ships of from 200 to 700 tons. Ayres Quay is just off the top left of the map available here. On the south back of the river, below the Deptford shipbuilding yard of Sir James Laing. Need help re John Robinson! Now, thanks to Peter Kirsopp, we can now tell you a little more about John Robinson, or maybe about both John & James Robinson. And about James Robinson their father. James Robinson (1785/1861 or later), born at Skelton, North Yorkshire, was a shipbuilder at Deptford from 1841, a builder who apparently suffered in the shipbuilding slump of the 1840s. He had at least two sons, i.e. John Robinson, born at Bishopswearmouth, & James Robinson (hereinafter referred to as James Robinson #2). In 1851 he was described as a shipwright only. John Robinson (1815/? ), was in the shipbuilding business at Deptford (presumably at Ayre's Quay) probably from 1846 - in 1851 he employed 47 men, & 10 years later, in 1861, he employed 30 men & 11 boys at his facility. In 1871 he is described as a 'late shipbuilder', with his father living with him. James Robinson #2 (1820/?) was in the shipbuilding business in 1851, at Low Pallion, employing 13 men. At 1871 his status is unclear, but probably was retired. He was then living in a house inside the shipyard at Low Pallion. with no employees indicated. Peter Kirsopp has additionally provided to the webmaster a list of 45 Robinson built ships, covering the period of roughly 1856 thru 1863. Peter's list, an 'rtf' Word file, is available here. Ayre's Quay is better known to the webmaster for the 'Ayres Quay Bottle Works', which bottle works operated there for over 200 years, from about 1723 to 1942. A start upon the site inclusion of vessels built by 'Robinson'. In a table in build date sequence. Just four vessels today. Hopefully more in the future. A 3-masted barque, completed in Feb. 1860. Per 1 ('pdf' file, Court of Inquiry re 1876 sinking), 2 (summary of the Court hearing). The vessel is not listed at Miramar. 119.0 ft. long. Signal letters PSKD. The webmaster has many editions of Lloyd's Register available to him from 'Google' books - see left. The vessel was built for J. (James) Dryden of North Shields, the managing owner, intended for the Black Sea trade it would seem. That means, I believe, coal on the outward journey, returning with grain. In the following years the vessel was used as a coaster registered at Sunderland, & then from Bristol to the Mediterranean registered at North Shields. The vessel would seem to have traded into the Mediterranean for a great many years, ex Gloucester or Bristol. D. Wallace served as her captain thru the 1869/70 Lloyd's Register & then J. Wallace (related perhaps?) until 1873/74 when J. Sprott became her captain. The Mercantile Navy List of 1870 states that John Dryden of S. Shields was then her owner. On Jul. 3, 1876, the vessel left the Tyne for Brindisi, SE Italy, with a crew of 13 all told & a cargo of 618 tons of coal. By Jul. 27, 1876, the vessel was about 35 miles to the eastward of Gibraltar. A little before 1 a.m., the vessel, travelling at about 4 knots, encountered fog. A little later, a steamer approached on her starboard quarter. Dinorah's fog horn was sounded & the crew shouted to attract attention. The steamer hit the barque, perhaps 'at full speed', close to the taffrail on her starboard quarter, carrying away much of the vessel's stern. I cannot figure out the exact time of the collision. While the crew tried to launch a longboat, the vessel sank beneath them. Only the Captain (his name?, maybe Sprott), the carpenter, who had been at the wheel, & a seaman survived - all the 10 others were drowned. The steamer was Dorunda, a passenger/cargo ship of 2977 tons, built in 1875 at Dumbarton & owned by British India Steam Navigation Company, ex London with a crew of 77 & about 33 passengers. Dorunda's boats picked up the 3 survivors from the water. J. Rounding, the 2nd officer of Dorunda stated, amongst other matters, that he had slowed his ship when the fog was first seen, which evidence the Court felt was not consistent with the known facts & particularly with the evidence of Mr. Taylor, Dorunda's 3rd Engineer, in charge of the engines at the time. The Court concluded that J. Rounding was responsible for the collision but did not consider his offence great enough to suspend his certificate. He was, however, instructed to 'exercise a greater degree of vigilance', in the future. The WWW record for this vessel, other than re Dorunda, is essentially non-existent. Can you add to and/or correct the above? A barque, completed in Aug. 1860. The vessel is not listed at Miramar. 116.0 ft. long (later 115.7 ft. only). Signal letters PWBR. Built for Jobling & Co. of South Shields, likely for the Mediterranean trade. The Mercantile Navy List of 1870 states that Jobling & Walker, also of S. Shields was then the vessel's owner. The webmaster has a number of Lloyd's Registers available & 'Jobling' would seem to have owned the vessel for many years, certainly thru 1874/75. The 1878/79 register, however, records J. (John) Carr, of Newcastle as then owning the vessel (but I do not know exactly when ownership changed). The vessel is recorded in the 1883/84 edition, with 'J. Carr & Son' the recorded owner - & the vessel is not recorded at all in the 1887/88 edition. The WWW record for this vessel is essentially non-existent. Can you tell us what happened to it? Or correct or add to the above. A wooden barque. Per 1 (Board of Trade inquiry into 1875 grounding, ex 'Accounts and Papers', published 1876, a 'Google' book). The vessel is not listed at Miramar. 118.5 ft. long, signal letters TVGC. Built for 'Potts, Bros' which was better or became 'R. H. Potts and Brothers' in 1867, of Sunderland. The webmaster has a number of Lloyd's Registers available & 'Potts' would seem to have owned the vessel for many years, certainly thru 1874/75. The vessel would seem to have been then sold - in view of the next data. On Oct. 14, 1875, Plover, then owned by 'John Firth of Sunderland and another', John Wright in command, left Taganrog, Rostov Oblast, Russia (Sea of Azov, Black Sea), with a cargo of wheat, bound for Queenstown, (now Cobh, County Cork, Ireland) with a crew of 10 all told. At midnight on Nov. 1, 1875 the vessel was hove to with Khoraz Light (Sea of Marmora near the village of Khoraz) 4 miles to the NNW, awaiting daylight to approach the Dardanelles. In hazy weather & with a moderate gale, the vessel continued W. by S. & soon after 6 a.m. on Nov. 2, 1875 the vessel ran aground, 10 miles W. of their estimated position. They tried to get the ship off. Thick fog until 6:30 a.m. Two tugs from Gallipoli tried to pull the ship off at 8 a.m., but to no avail. The ship was leaking badly, 3 1/2 ft. of water 'in the well'. The weather worsened & at 4 p.m. the crew took to the boats & landed safely close by. On Nov. 4, 1875, they returned to the ship but found her 'parted amidships' & finally abandoned her. The Court considered that the ship could not possibly have sailed along the northern shore of the Sea of Marmora without Khoraz Light being brilliantly visible - and it wasn't. So the grounding was the result of navigational errors. The Court cautioned the Captain to be more careful in the future but returned to him his certificate. Except for the above, the WWW record for this vessel is essentially non-existent. Can you correct or add to the above. A wooden barque, which had a very short life. Per 1 (data), 2 (the collision on Dec. 19, 1867, ex 'The Nautical Magazine' Vol. 37 re 1868, p#108), 3 (Startled Fawn, some Lloyd's Register listings). The vessel is not listed at Miramar. 128.7 ft. long, signal letters HBDT. Built for C. Newman, I understand of Liverpool, with the ship registered at London. The webmaster has a number of Lloyd's Registers available ex Google books, & 'C. Newman', i.e. Charles Newman, owned the vessel for what appears to be its entire short life, thru to the 1866/67 edition of Lloyd's as at left. Engaged in U.K. waters perhaps but the 1866/67 edition of Lloyd's Register records an anticipated voyage to Singapore. On Dec. 17, 1867, Rushing Water, then said to be owned by 'Newman & Co.', left Sunderland for Madras, India, with a cargo of coke, iron & machinery, including steam engine parts for the East India Railway. 'G. Pearson' was her captain with a crew of 14 all told. The vessel was off the coast at Hastings, East Sussex, on Dec. 19, 1867. Also then off that coast was Startled Fawn, an iron ship said to be of 763 tons, which reported tonnage is surely incorrect. Startled Fawn was a fully rigged iron sailing ship, i.e. a clipper ship, built in 1855 at Warrington, & owned by Fletcher & Co. (George H. Fletcher & Co.) of Liverpool, listed as being of 1164 tons, signal letters HGSF, ON 1144. Startled Fawn was commanded by one Captain King, but an Isle of Wight pilot was aboard & the captain was confined to his cabin having been there for a week with a paralytic fit. 109 days out of Calcutta, India, & bound for London, with a cargo of rice, seed, cotton & jute. 30 were aboard all told. The conditions were bad - thick, impenetrable, fog. At about 7:30 p.m. on Dec. 19, 1867, Rushing Water came into Startled Fawn's view less than a ship's length away. Were both ships not sounding their bells? Regardless, the two vessels collided - 'so terrible was the force with which they met that both of them immediately foundered' - or so it was written. It would seem, however, that that was not exactly so. Rushing Water sank within 7 minutes & its entire crew transferred to Startled Fawn, which also began sinking despite pumping efforts. By midnight she had 15 feet of water in her holds & was sinking by the bow. Both crews, 44 in total number, took to the 3 boats of Startled Fawn & after rowing for some considerable time, they came upon Little Polly, a Hastings fishing lugger, commanded by Thomas White. Little Polly took all 44 aboard & landed them at Hastings at or about 10 a.m. on Dec. 20, 1867. The Hastings Chronicle of Feb. 21, 1868, (70% down here) recorded that 'For getting shipwrecked men ashore from the Liverpool vessel Startled Fawn, in collision 12 miles off Hastings on December 20, �Tuppy� Stonham and his crew on Little Polly were given a �7 reward.' The wreck of Rushing Water lies today in 90 ft. of water at 50.45.25N/ 00.37.834E, or at 50.45.15N/00.37.50E, maybe 12 miles off the East Sussex coast at Hastings. The wreck was, it would seem, located by Nigel Ingram & his mate Jon, whose fishing gear snagged on the wreck in 1987. It is Nigel who indicates that the vessel was carrying a cargo of steam engine parts, many of them of bronze - which engine parts are long gone from the wreck! The ship was identified by its ship's bell. I am sure that that bell still exists somewhere. An image of it would be most welcome! The WWW record for this vessel is modest. You would have thought that there would have been an Official Inquiry into such a collision, which collision is said to have been mentioned in 'Illustrated London News' (can anybody track that reference down?) David Renno provides a detailed account of the disaster in 'Beachy Head Shipwrecks of the 19th Century', see here. Can you add to or correct the above? Is the location of the wreck of Startled Fawn known, I wonder? Another yard where my data is most limited. I believe that the yard was established during WW2 at Southwick, on the site previously operated by Swan, Hunter & Wigham Richardson Ltd., which site was at the time quite vacant. The yard was supposed to open in the summer of 1942 but may well have opened rather later, at a date in 1943. It built very few ships it would seem. The company ran 2 yards from the limited data I have read, this yard on the Wear and the Low Walker site on the Tyne, previously the yard of Armstrong Whitworth. If you can help with the yard's history, I would welcome your additional data. Names of just a few of the vessels constructed by Shipbuilding Corporation Ltd. - in a table in build date sequence. This list will be short even if we are able to record all of the vessels they built - just a dozen, I think. A cargo ship. Per 1 (Turnbull Scott history, 50% down), 2 (WW2 convoy duty, Empire Cowdray), 3 (WW2 experiences, Empire Cowdray, 75% down, BACK ON CARGO SHIPS), 4 (Miramar, link, you now must be registered to access). 136.5 metres long overall, 129.5 metres perpendicular to perpendicular, 447.8 ft., speed of 10 knots. Built for the Ministry of War Transport & initially managed by 'Capper, Alexander & Company' & then by 'Goulandris Bros.' ('Goulandris'), both of London. Just 7 WW2 convoy references, in the period of Nov. 1944 thru Mar. 1945. Includes 3 N. Atlantic crossings. 3 refers to WW2 service thru to the Indian Ocean. The vessel was sold, on Jul. 29, 1948, to Goulandris, & renamed Granhill. A couple of court cases, it would seem. In 1950, the vessel ran aground in the River Weser (Bremen, Germany) & tugs Elsfleth & Rechtenfleth attended. Granhill was re-floated on the next flood tide 'without appreciable risk to tugs, services occupying about eight hours'. The tugs claimed remuneration. Have not read the outcome. In Dec. 1950, the vessel loaded timber at Lagos, Nigeria. Her boilers had been filled with river water at Sapele, as a result of which the port boiler failed (sludge). Again, a court case resulted, Goulandris v. 'B. Goldman and Sons, Ltd.' the owners of the cargo. Have not been able to read the circumstances nor the decision. Can anybody fill in the detail, on both cases? Granhill was sold, in 1951, for �350,000, to Turnbull, Scott & Company Limited, a tramp ship company, & renamed Baxtergate. In 1960, she was sold to 'British Iron and Steel Corporation' (BISCO), & allocated to Thomas W. Ward Limited, of Barrow-in-Furness, Cumbria, to be broken up. On Dec. 1, 1960, the vessel arrived at Barrow with 9,150 tons of iron ore, ex B�ne, Algeria. Her last trip. Her cargo unloaded, she was moved 100 metres to the nearby 'Thos. Ward' ship breaking facilities where she was broken up. Can you add anything? A cargo ship. Per 1 (fine data by Michael McFayden, images), 2, 3 & 4 (newspaper articles re wreck), 5 (WW2 convoy duty, Empire Gladstone), 6 (Miramar, link, you now must be registered to access). 137.2 metres long overall, 129.2 metres perpendicular to perpendicular, 429.8 ft. long, speed of 10 1/2 knots, single screw. Built for the Ministry of War Transport, with 'J. Chambers and Company' the managers. 42 WW2 convoy references, with at least one N. Atlantic crossing. Mainly however saw service (10 voyages) to Seine Bay, France, re the Normandy landings I believe, in Jun/Sep. 1944, & later, in 1945, 8 trips to Antwerp, Belgium. Some WW2 detail at link 1 & at other sites. It would seem that the Ministry was the vessel's sole owner. The vessel was re-engined by 1949. 'McIlwraith McEacharn Ltd.', I believe, were later the managers. In or about Aug. 1949, the vessel was time chartered (ex a 'Google Books' law report), by 'Blane Steamships Ltd.' ('Blane'), (a relationship perhaps with Adelaide Steamship Company Ltd. ('Adelaide'), of Adelaide, Australia? Have seen many references to Blane being, in fact, the vessel's manager & Adelaide being the charterer). On Sep. 1, 1950, with Captain John Lennie, OBE, in command, & a crew of 44, the vessel left Whyalla, South Australia, for Sydney & Newcastle, both New South Wales ('NSW'), with a cargo of iron ore destined for the BHP steelworks at Newcastle, but also with 159 Dodge Utility vehicles or bodies thereof, motor vehicle spare parts & tools. It would seem that the vehicle bodies were deck cargo? The vessel travelled close to the coast, & the lights of Merimbula, NSW, were mistakenly thought to be a lighthouse. Evasive action was taken when the error was realised, but as the vessel swung, the vessel's stern hit, at 7:55 p.m. on Sep. 5, 1950, a submerged reef at Haystack Rock, Ioala Point, about 8 km. SE of Merimbula. The value of the ship & cargo was estimated at �750,000. The vessel's propeller jammed on the rocks, the rudder was bent & she was hard aground. The engine would not turn over. The vessel was badly holed, its bottom ripped out from bow to bridge. It's back was soon broken, she was taking in water - 20 plus feet of water in the holds - & in danger of splitting apart. Over the succeeding days, all of the vehicles bodies were unloaded via 8 or more local trawlers - & landed at nearby Merimbula's single wharf. The vessel stayed in situ until a storm hit on Sep. 11, 1950. The vessel then sank & the remaining crew were landed. 10 of the crew had been landed at Merimbula on Sep. 7, 1950, & 14 on the 9th, having stayed aboard to help with the unloading. Wreck lies at 36.57.14S/149.56.79E. A most interesting anecdote at 4. One of the crew was named Sammy Harris, a fireman. This was, amazingly, his ninth time being shipwrecked! 'I've had it. I'm going to find myself a nice quiet job ashore. Even cats only have nine lives, and I've used up my quota.' Also aboard was a donkey-greaser named Ernest Wood, for whom this was his 5th shipwreck! I hope that they both had better luck playing the pools. The ship's anchor & its bell were both salvaged - the bell still serves aboard a boat named Nadgee. The wreck itself was sold to B. Buckland, a hotel keeper of Merimbula, for �1,250. A popular dive site today, hull largely intact, lying in about 10 metres of water, safest visited in calm weather. Can you add anything? The report of the Official Inquiry? Images? The available imagery might, shall we say, be improved. A cargo ship. Per 1 ('convoyweb.org', WW2 convoy duty, Empire Mandalay), 2 ['Harrison', Tribesman (2)], 3 (data & image, Tribesman, but you must be registered to access it), 4 (Miramar, link, you now must be registered to access). 137.2 metres long overall, 129.2 metres perpendicular to perpendicular, 429.8 ft long, 450.0 ft. long overall, speed of 11 knots. Built for the Ministry of War Transport & managed by R. Chapman & Son, of Newcastle. Just five WW2 convoy references, including one N. Atlantic crossing in Jan/Feb 1945, & U.K. coastal. I presume that there were many independent voyages during WW2, but that is data to which 'convoyweb.org' chooses to deny me access. The vessel was sold, on Nov. 26, 1946, for �141,703, to Charente Steam Ship Co. Ltd., ('Harrison Line') owned & managed by Thos. & Jas. Harrison, of Liverpool, & renamed Tribesman. Harrison Line, I read, had served Calcutta, India, for 87 years when, on Sep. 19, 1957, Tribesman left Calcutta for U.K. via Colombo, Sri Lanka, & was the last Harrison vessel to serve both ports. The vessel was sold again, on May 15, 1961, to 'Margalante Compagnia Naviera SA', of Panama, but registered at Beirut, Lebanon, & renamed Delta. Later in 1961, the vessel was sold to Sigma Shipping Company Ltd., of Hong Kong, & on Aug. 16, 1961 the vessel arrived at their Hong Kong ship breaking facilities to be broken up. Break up commenced on Sep. 9, 1961. Can you add anything? A cargo ship. Per 1 [Benvannoch (4)], 2 HMS Loch Lomond Aug. 1962), 3 (Miramar, link, you now must be registered to access). 430 ft. long, speed of 10 1/2 knots. Built for the Ministry of War Transport & initially managed by W. J. Tatem Ltd. & then by Goulandris Bros. of London. Just two ref. I could spot to convoy duties in WW2 in Aug. 1944 & May 1945. The vessel was sold in 1948 to Goulandris Bros. & renamed Grandyke. It was sold again, in 1949, to William Thomson & Co., of Edinburgh, Scotland, (Ben Line), & renamed Benvannoch. And sold in 1953 to Elswick Steam Shipping Co., also of Edinburgh. It was sold for the last time in 1956 to Helmville Ltd. (M. Alachouzos the manager? ), of London, & renamed Medina Princess. On Aug. 8, 1962, the vessel ran aground of a reef at Djibouti but was refloated '& moored'. Per 2, HMS Loch Lomond, a Loch Class frigate, tried to assist 'to carry out salvage operation on ss MEDINA PRINCESS which was alongside with extensive flooding, possibly due to disaffection of crew. The attempt to control flooding was a total failure as no details of pipe system were held on board.' On Sep. 1, 1964, the vessel broke from its moorings, again at Djibouti, ran ashore & was a total loss. 'Reported abandoned' in 1968. Can you add anything? A cargo ship. Per 1 (Kaye, Martagon, summary data), 2 ('convoyweb.org' WW2 convoy duty, Empire Prome), 3 (Lloyd's data, Empire Prome), 4 (Miramar, link, you now must be registered to access). 430 ft. long, speed likely about 10 knots, cruiser stern. Built for the Ministry of War Transport, initially managed by W. Runciman & Co. Ltd., of Newcastle, & then by Kaye Son & Company Ltd., of London. Just two ref. to WW2 convoy duties - in May 1945 from Liverpool to New York City & in Aug. 1945 from Bombay, India, to Port Dickson & Port Swettenham (now Port Klang), both Malaysia. There presumably were independent voyages which records I am not permitted to access - but you surely can. On Nov. 26, 1946, the vessel was chartered to Walmar Steamship Company Ltd. ('Walmar'), a company owned & managed by Kaye. In Aug. 1946, the vessel carried 1567 parcels of relief supplies from Australia to Genoa, Italy, for forwarding to Geneva. The vessel was sold, on Jul. 25, 1947, to Walmar, & renamed Martagon. It would appear that in 1951, Martagon ripped her bottom out on a wreck, was beached, re-floated & taken to Flushing (Vlissingen, Netherlands, I presume) for repairs. Have not been able to read exactly where it happened nor the circumstances. Can you tell us - and also about the next item? On Nov. 15, 1957, while in the river Elbe, en route from Aalborg & Hamburg for Venezuela with a cargo that included cement, the vessel was in collision with Moselstein. Have not read the circumstances. Martagon was beached, & on the next day re-floated. It would seem to have made Hamburg under its own power for repairs. Moselstein had to be towed there for her repairs. Martagon was laid up at Blackwater River, Mersea, from Jan. 1958. In 1959, the vessel was sold to Ipar Transport Co. Ltd., of Istanbul, Turkey, & renamed Mehmet Ipar. The vessel was laid up at Istanbul, on Jun. 15, 1963, & never saw service again. In Sep. 1970, the vessel was sold to 'llhami Soher-Balat', & arrived at their Halic, Istanbul, ship breaking facilities to be broken up. Can you add anything? A cargo ship. Per 1 [Houston Line, Hesperides (4)], 2 [Clan Line, Clan Murray (4)], 3 (Miramar, link, you now must be registered to access). 136.9 metres long overall, 129.8 metres perpendicular to perpendicular, 431 ft., speed of 11 knots, signal letters GJSK. Launched as Empire Longstone for the Ministry of War Transport. But completed as Hesperides for British & South American Steam Navigation Co. Ltd., of London, Houston Line Ltd. ('Houston') the managers. The vessel was sold or transferred, in 1960, to Clan Line Ltd. (a company related to Houston) & renamed Clan Murray. On Nov. 25, 1962, the vessel arrived at the Hirao, Japan, ship breaking facilities of Matsukura KK, to be broken up. Can you add anything? A cargo ship. Per 1 (French data & image, Chef M�canicien Durand), 2 (Compagnie G�n�rale Transatlantique, French Line, Chef M�canicien Durand), 3 (re pirates), 4 (Miramar, link, you now must be registered to access). 136.9 metres long overall, 449 ft. & 431 ft. (perpendicular to perpendicular, I presume), speed of 12 knots. The vessel was laid down for the Ministry of War Transport as Empire Stronsay, was launched as Louis E. Durand for the French Government, but was delivered to the French Government as Chef M�canicien Durand, Compagnie G�n�rale Transatlantique the managers, & registered at Le Havre, France. Its maiden voyage was from Le Havre to New York on Dec. 31, 1946. It would seem that the vessel was found to be expensive to operate so she was sold, in 1949, to 'Cie. Maritime Normande', of Rouen, France, or Le Havre, managed by 'J. Chastellain et Compagnie', of Rouen, & renamed Rollon. And sold again, in 1963, to 'Marguardia Cia Naviera SA', of Piraeus, Greece, 'Aegis Shipping Co.' likely the managers, & renamed Aeakos. On Sep. 9, 1965, while en route from Zamboanga City, Mindanao, the Philippines, to Antwerp, Belgium, with a cargo of copra insured for $3 million, the vessel ran aground on a reef. At 5.07N/112.33E, in the South China Sea off South Luconia Shoals, about 90 miles off Sarawak. I have not WWW read the grounding circumstances. Rode Zee, a tug, came to her assistance. The vessel was badly damaged & efforts to re-float the vessel were not successful. The entire crew was taken aboard Rode Zee & landed at Singapore while the vessel was abandoned in international waters. A salvage vessel (its name? ), left Singapore on Nov. 11, 1965, & made efforts to unload the cargo of copra, placing a 3-man security guard on board Aeakos. But on Dec. 6, 1965, (have also read Dec. 5, 1965), the vessel was boarded by 100 pirates in six boats. The guards fled to the salvage vessel & the pirates were left to their looting & pillaging (first time I have been able to use those words on site!) of the ship. It is possible that the pirates were later chased off the ship. Can you add anything? A cargo ship. The last vessel that the company built. Per 1 [Palm Line, Lagosian (2)], 2 & 3 (United Africa Co. Ltd./Palm Line/Unilever history), 4 (data & image, Heraclitos), 5 (Miramar, link, you now must be registered to access). 137.2 metres long overall, 125.5 metres perpendicular to perpendicular, 431 ft. long, speed of 10 1/2 knots. Laid down, in 1945, for the Ministry of War Transport as Empire Ronaldsay. But completed in 1947 for United Africa Co. Ltd., of London (a 100% subsidiary of 'Unilever', known as Palm Line, formed in Liverpool in 1929) ('United'), as Lagosian. Transferred in 1949 to Palm Line Ltd., of London, a United subsidiary company formed in 1949, & renamed Lagos Palm. But operated by United. Was renamed Oguta Palm in 1960 (to free up the prior name) - no ownership change. In 1964, the vessel was sold to 'Skaramanga Shipping Co.', of Piraeus, Greece, ('M. Scufalos', & then 'G. Eleftheriou' (in 1968), both of Greece, the managers), & renamed Heraclitos. Gross tonnage, per Miramar, changed to 7356. Can that be correct? The vessel was sold again, in 1969, to Helean Navigation Co. Ltd., of Famagusta, Cyprus, no change in manager, & renamed Herodemos. On Apl. 4, 1973, the vessel arrived at the Brodospas ship breaking facilities at Split, Yugoslavia, to be broken up. Can you add anything? I am having some difficulty in explaining exactly what the image that follows is all about. It would appear, however, that an exhibition was held in Sunderland, from April 18 to May 17, 1977, at the Sunderland Arts Centre, to promote a rather unusual subject - American crate labels of five decades & their interesting artwork. Included was a label which featured & promoted California apples. The original label, which would seem to date from the 1920s or 1930s is about 10 or 10 1/2 in. by 9 3/4 in. in size & was apparently overprinted in some way for the occasion. Such a label was offered for sale via eBay some years ago & two examples of it are available as this page is amended in Mar. 2019. Here & Here. Do drop by! It is a truly a splendid label, is it not! A message from Sandy Davison, whose father John Davison was aboard Newton Pine, that day in 1940. Further to our recent exchanges please let me provide you with some information re the Newton Pine particularly regarding the part relating to my father John Davison. The Newton Pine was sailing in the Atlantic on the 13th December 1940 - position Lat: 2-06 North, 22.02 West and the weather was fine and clear. At 15.50 a torpedo was observed to break surface at about 1500 yards bearing 145 deg on the starboard bow. Avoiding action was taken and the torpedo passed approx 15 feet from the starboard bow while the vessel was still swinging. At 16.25 a submarine broke surface slightly on the port quarter at a range of about 7/8000 yards. Shots were fired and dropped approx 1500 yards astern of the Newton Pine. Gun crew were sent to action stations and the first salvo fired fell short and to the left. The next salvos fell nearer the submarine. The submarine continued firing and appeared to be becoming more accurate and some damage was done to the Newton Pine. A shot from the Newton Pine appeared to land 'dead on target' and the enemy abruptly stopped firing and submerged. Avoiding action was taken by the Newton Pine by dropping a smoke float astern to conceal movements and a course was set for 315 deg. The action lasted approx 30 mins. The Master's, Chief Officer's and Gunlayer's opinion was that the 20th and 21st salvos had put the submarine out of action. Darkness fell and action stations were maintained till dawn. The submarine was not seen again and was presumed to have been sunk. From the log of the U65 a number of interesting fact are found. This was the first German U-boat to cross the equator. The U65 spotted the Newton Pine at 20.00 on the 12th December. On the 13th in the log is entered "Steamer in sight. Moved forward. Steamer turns 45 dgs cutting across shortly before torpedo, target missed. Attempted torpedo from shallow angle. Steamer appeared to spot torpedo as it turns suddenly in order to use side guns. Surfaced for artillery engagement as I suppose that steamer was broadcasting. Fired approx 30 times. 2 possibly 3 hits. Steamer moves slowly when hits approach 100m. Turns away, stops firing. Observation of hits too unsafe. Steamer is broadcasting with directional transmitter but we can pick it up. Freetown repeats SOS on all wavelengths then transmits a 4 digit coded F T report of 7 groups. During the night lively bustle. The F Ts were partly repeated on 600m by Ascension. SOS was broadcast was transmitted about ten times. Newton Pine uses smoke screen and despite energetic attempts disappears from sight." The U65 then ran ahead on the general course of the Newton Pine but did not find her. This expands on the story you already know about. Thus the story is partly correct. The Newton Pine did not sink U65 but clearly thought that it did so. The log of the U65, held by the Admiralty, confirms the engagement. Prize money was paid out and distributed to the crew of the Newton Pine on a 'stripe basis' i.e. the amount received by each crew member was according to rank with the Master receiving most but all getting something. I have a copy of the receipt of that received by my father. It was not based on the value of the cargo but, I think, on the value of the submarine to the Admiralty. The information regarding the U65 was received from the Ministry of Defence in London and confirmed that U65 was commanded by Korvettenkapitan Hans-Gerrit von Stockhausen. After the engagement the U65 returned to Lorient on 10 January 1941. Under a different commander she was sunk with all hands on 28 April 1941 by HMS Douglas whilst attacking convoy HX 121. Trusting that this information is of interest to you. Sandy Davison, Ancrum, Scotland, Sep. 16, 2010. Webmaster's Comment. I am advised that the above interesting information comes from Sandy Davison, & also from Iain Davison, Sandy's brother, of Ponteland, Northumberland.